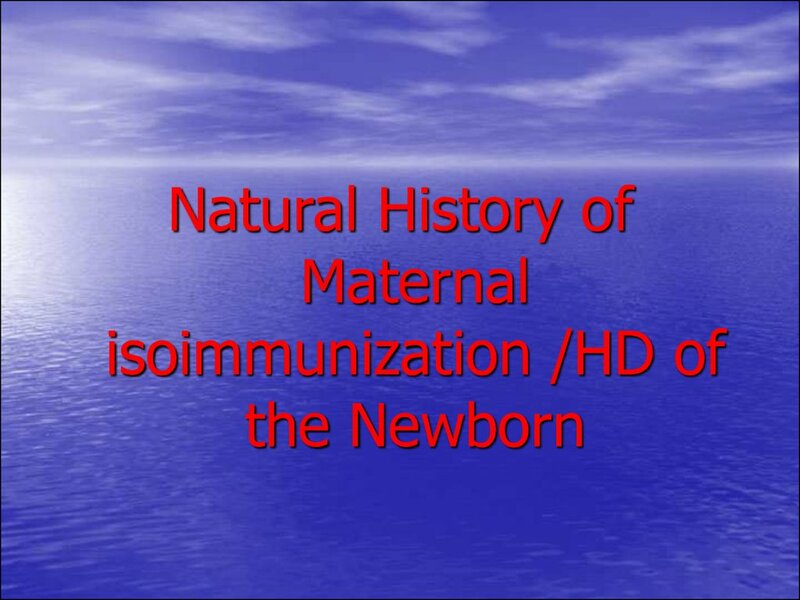 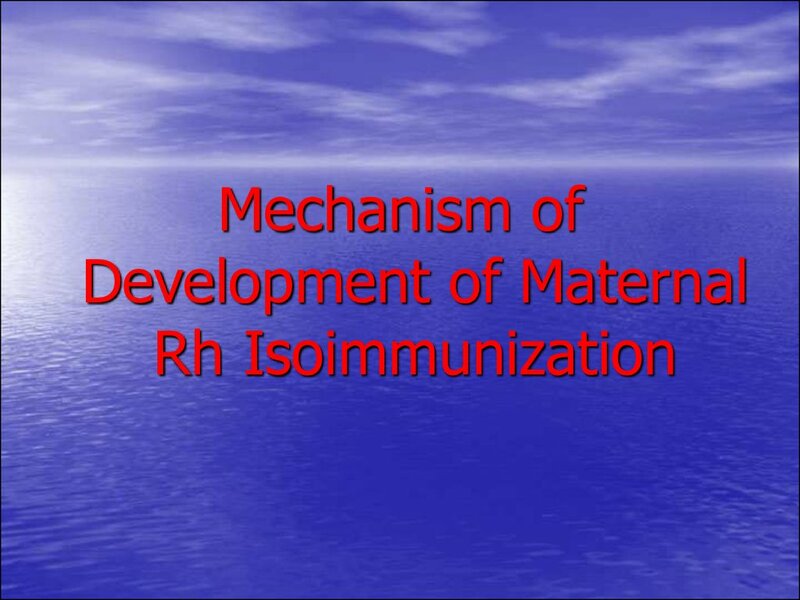 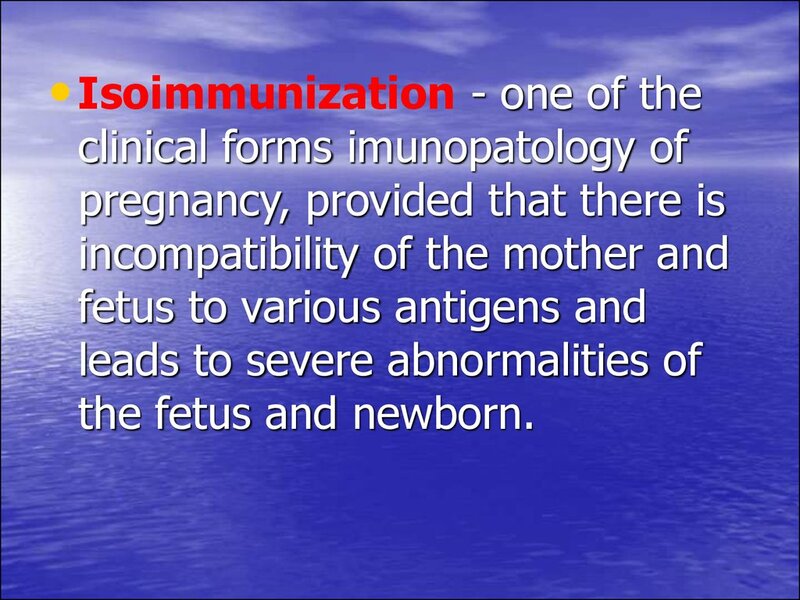 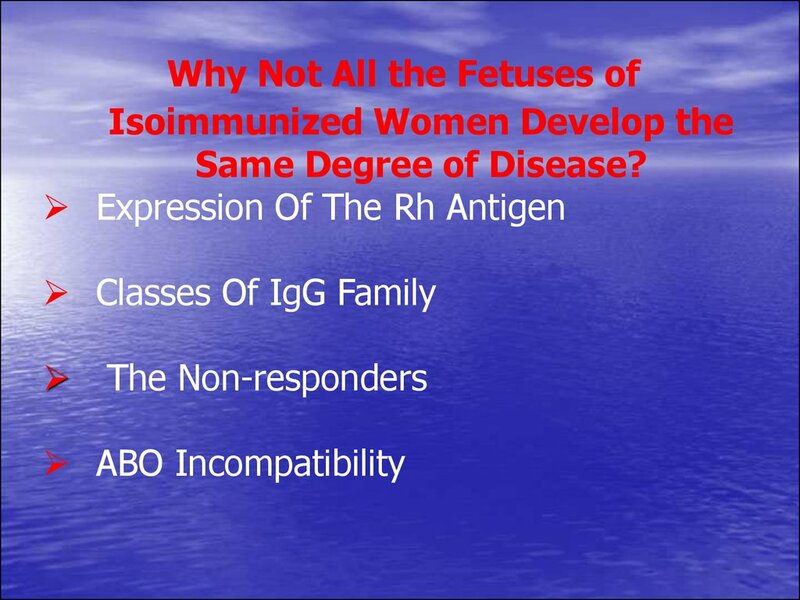 • The mother become Isoimmunized. 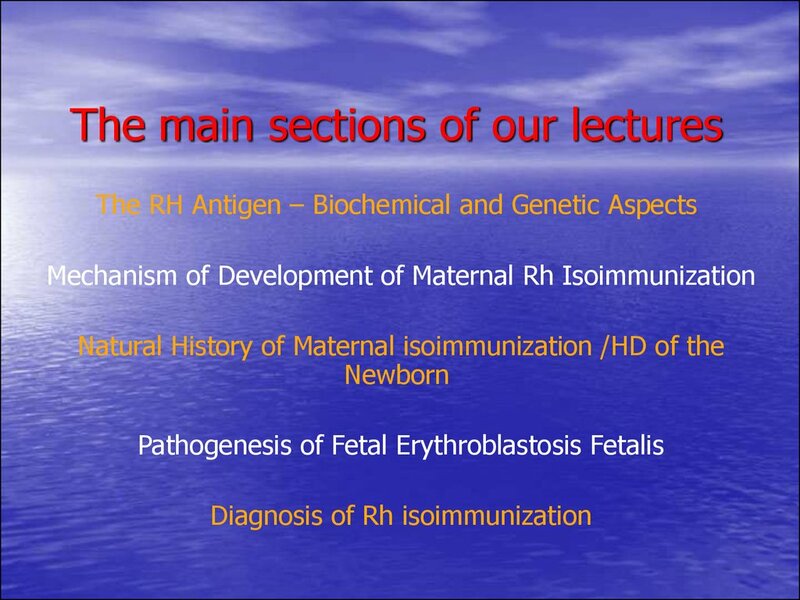 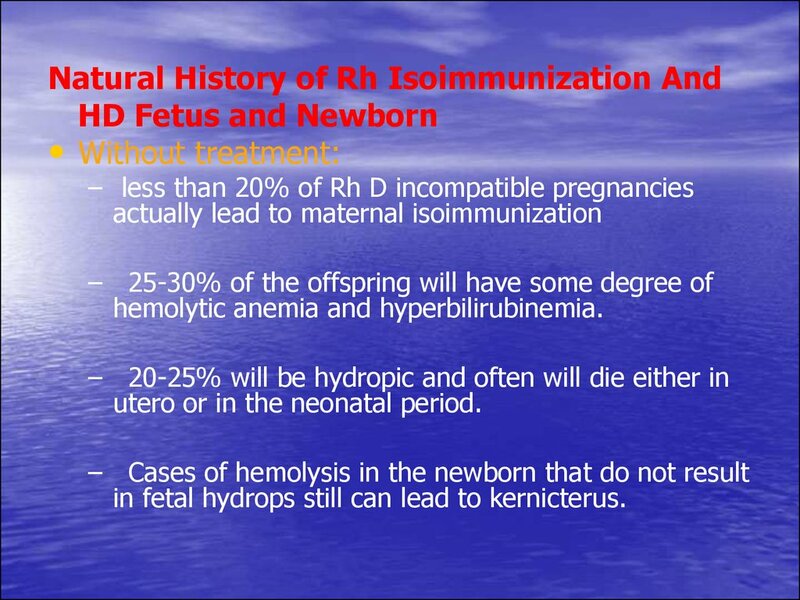 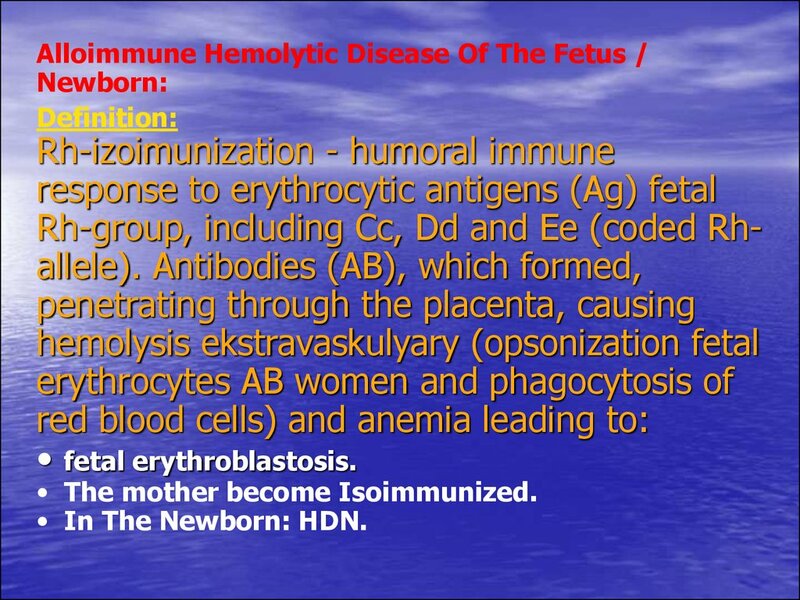 • In The Newborn: HDN. 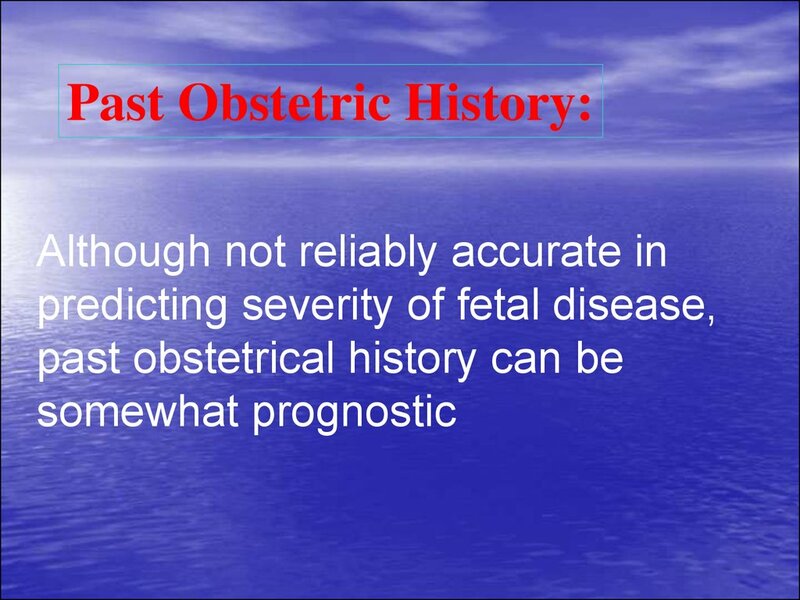 incidence is 15 percent in this group. 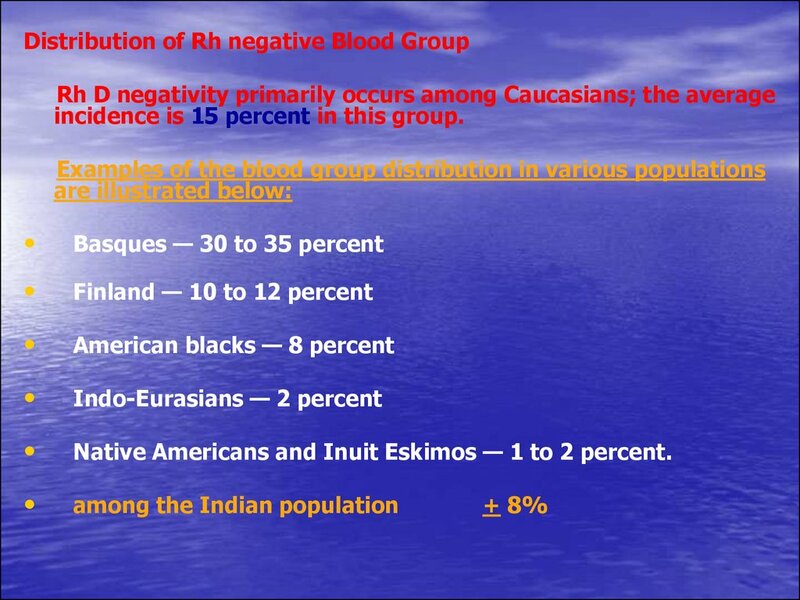 Native Americans and Inuit Eskimos — 1 to 2 percent. 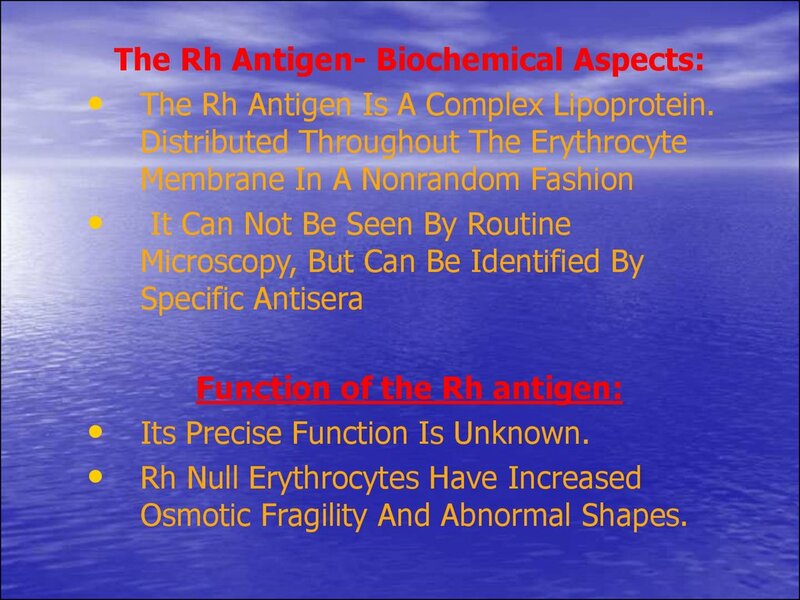 The Rh Antigen Is A Complex Lipoprotein. 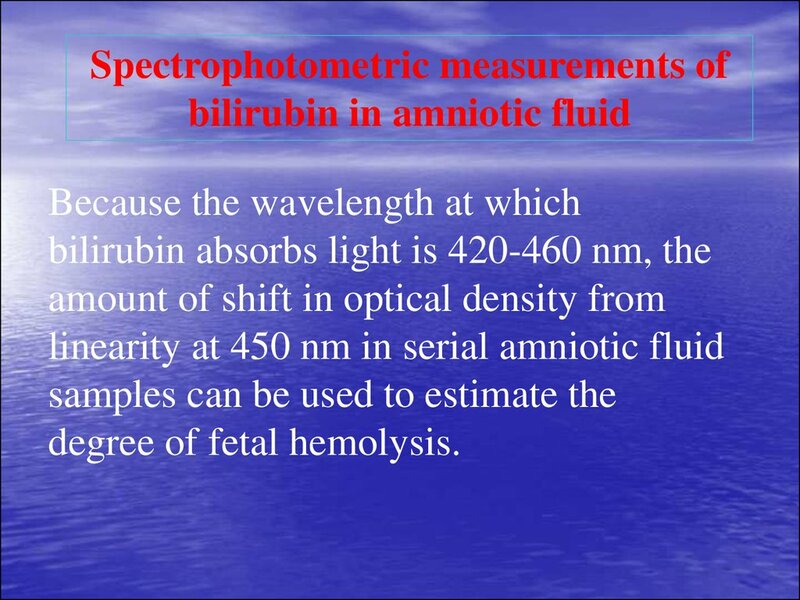 Its Precise Function Is Unknown. 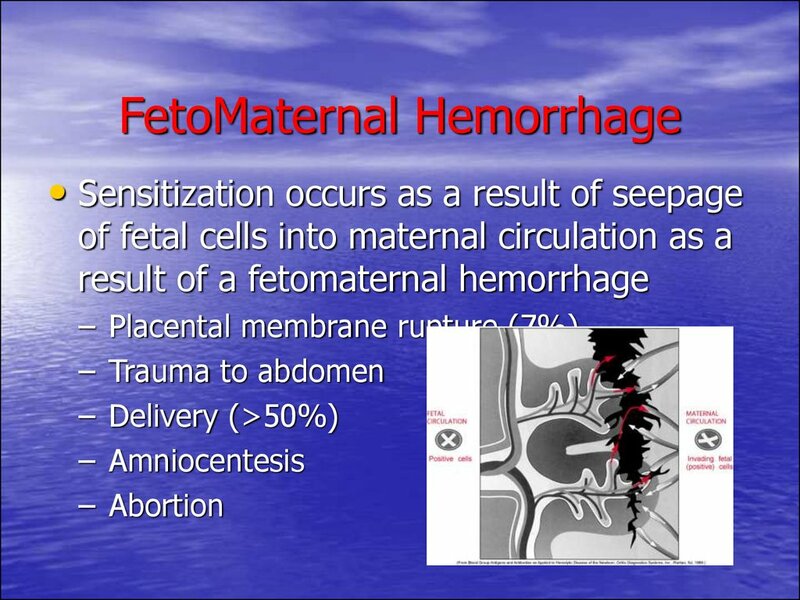 Osmotic Fragility And Abnormal Shapes. 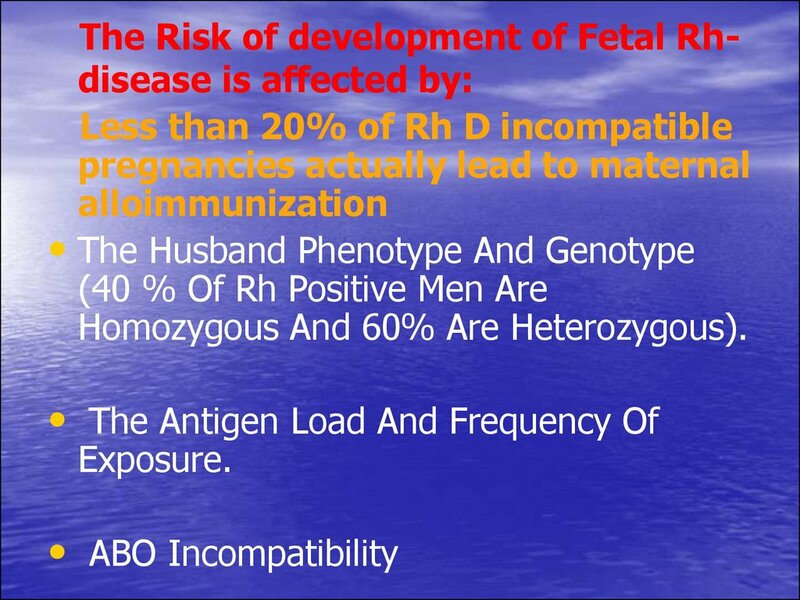 of the short arm of chromosome one. 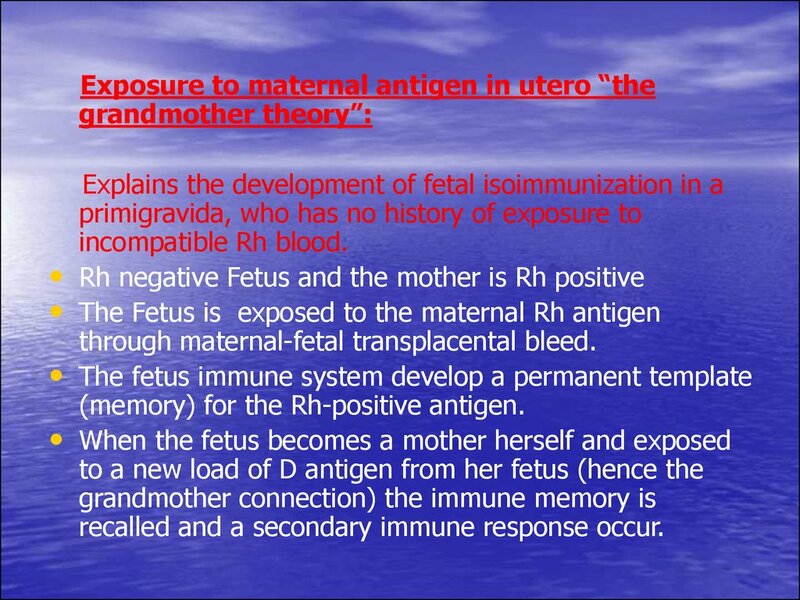 mother and one from the father. 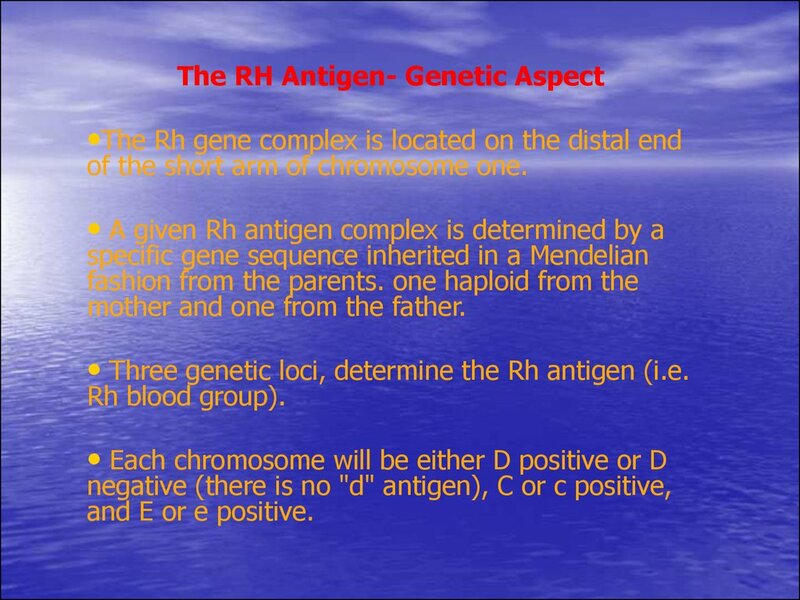 • Three genetic loci, determine the Rh antigen (i.e. 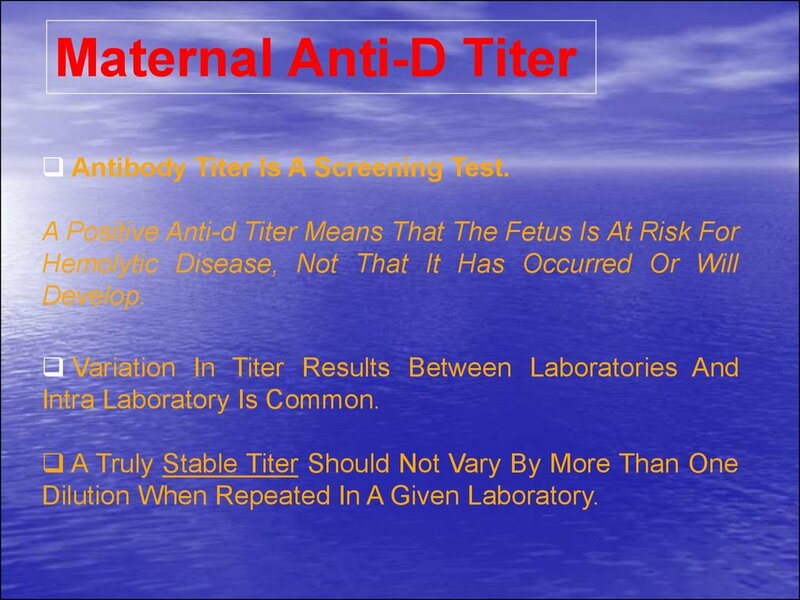 and E or e positive. 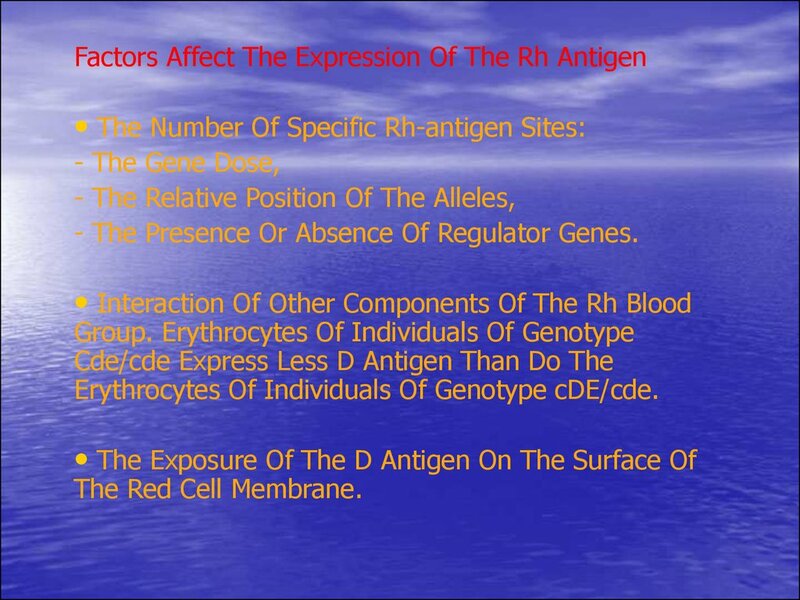 Genetic Expression Of The D Antigen. 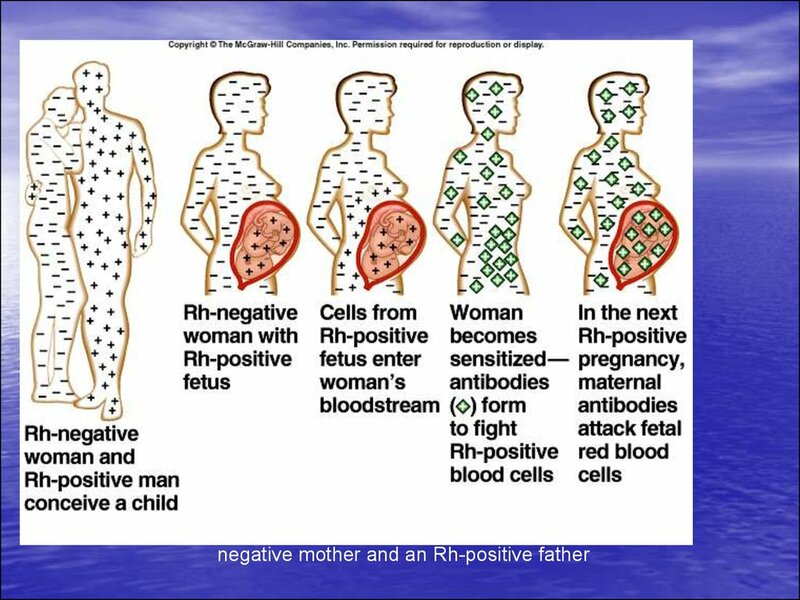 (They May Even Be Determined As Rh Negative). 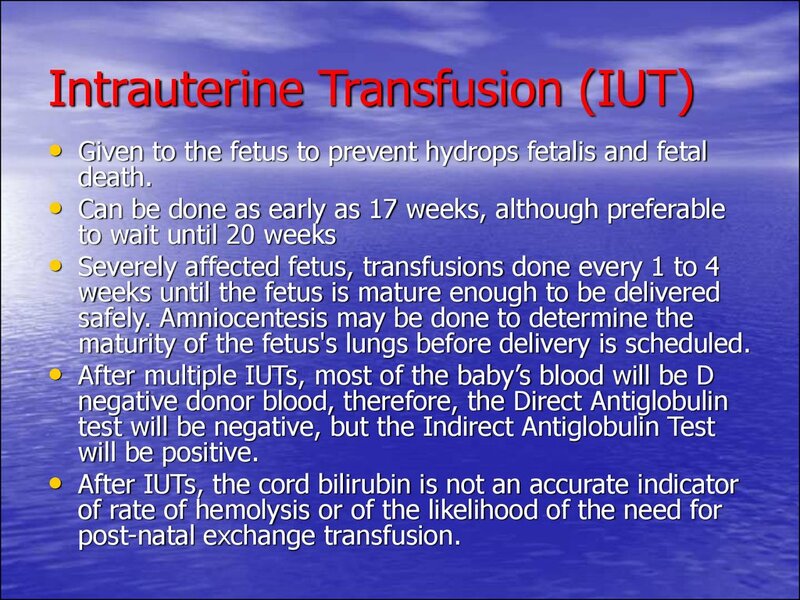 Or The Other Way Around May Take Place. 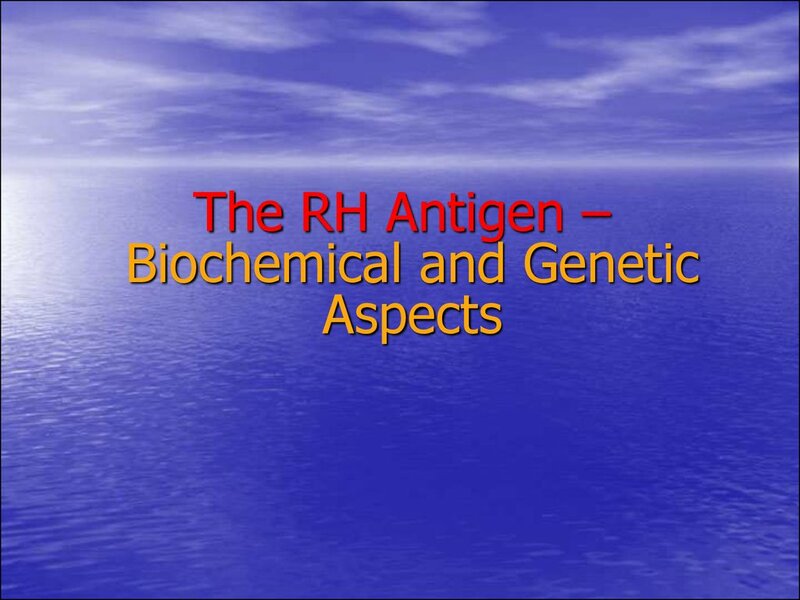 - The Presence Or Absence Of Regulator Genes. 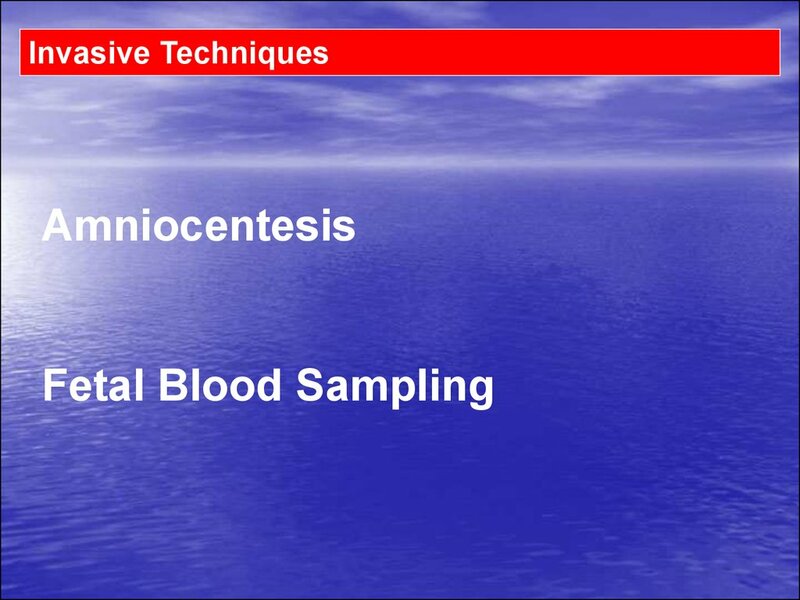 Erythrocytes Of Individuals Of Genotype cDE/cde. 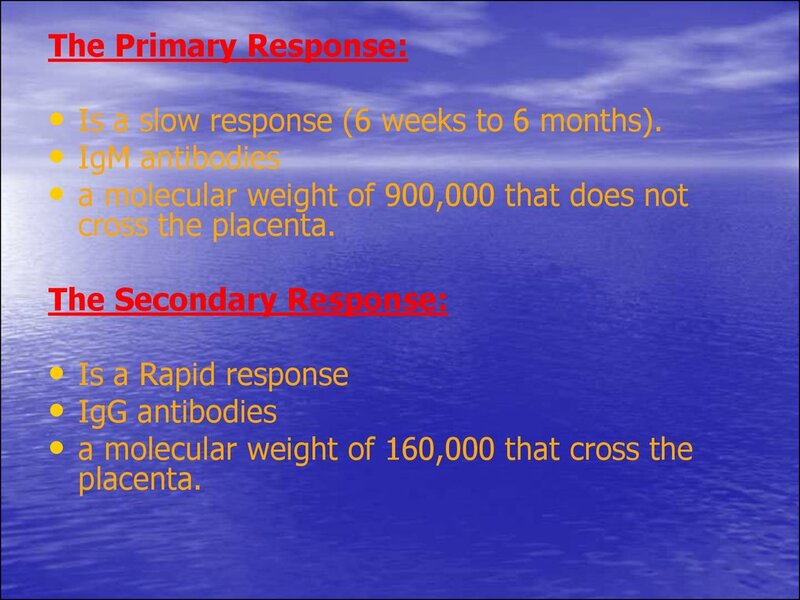 • Is a slow response (6 weeks to 6 months). 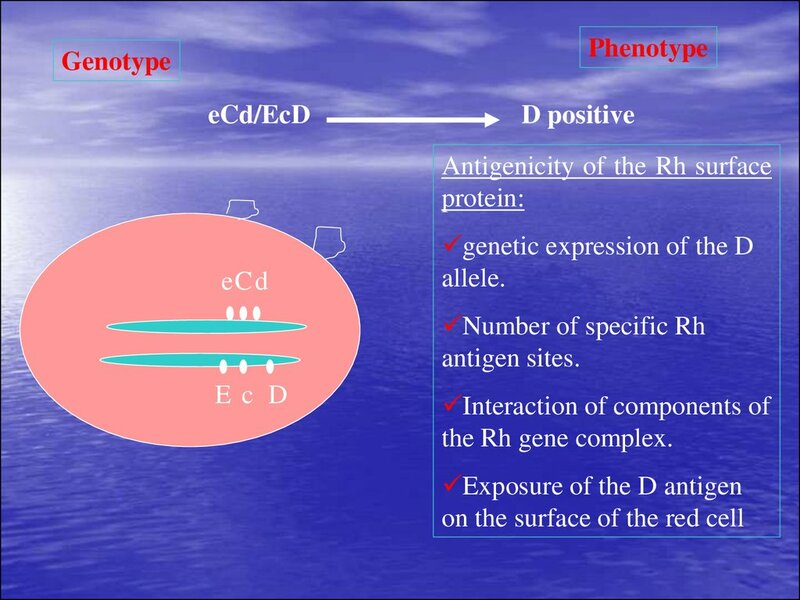 (memory) for the Rh-positive antigen. 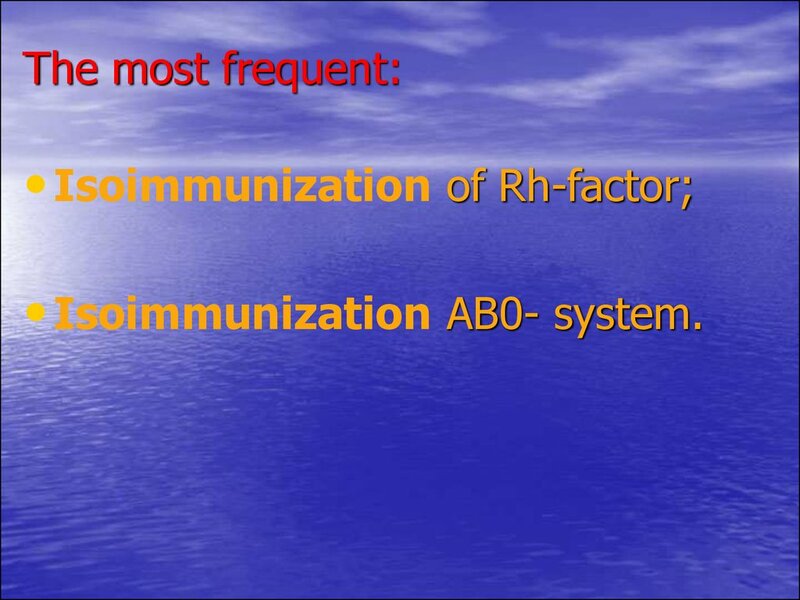 recalled and a secondary immune response occur. 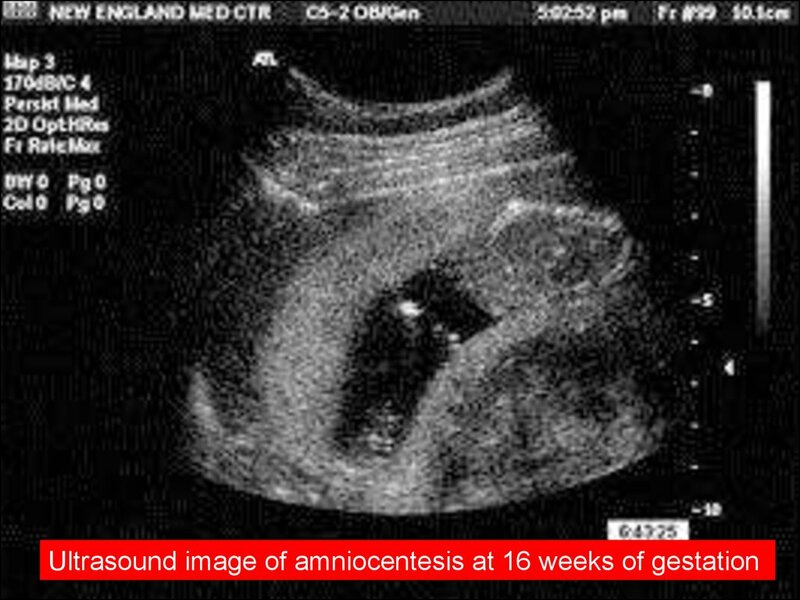 •6 wks to 6 M.
utero or in the neonatal period. 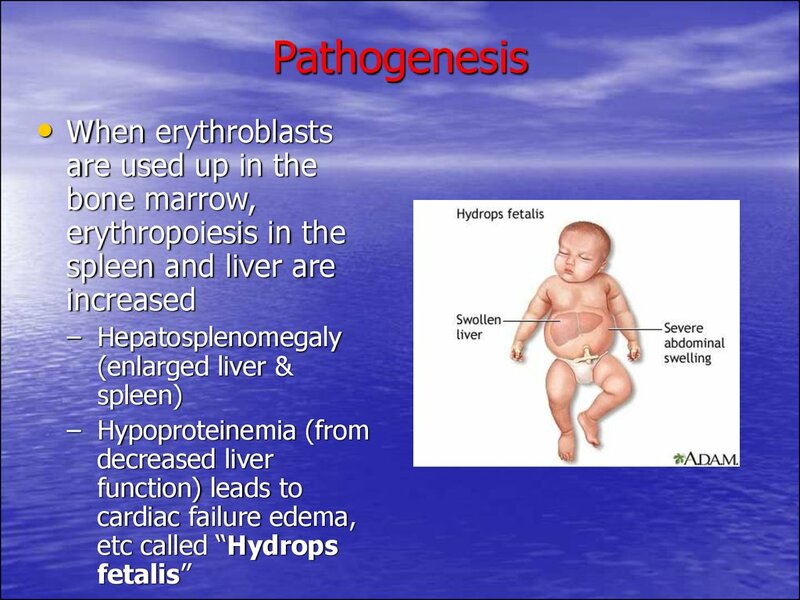 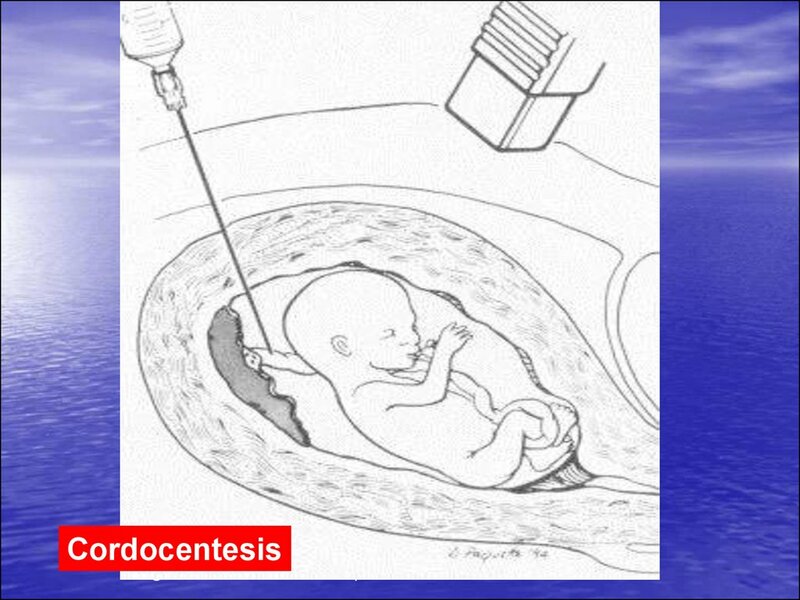 in fetal hydrops still can lead to kernicterus. 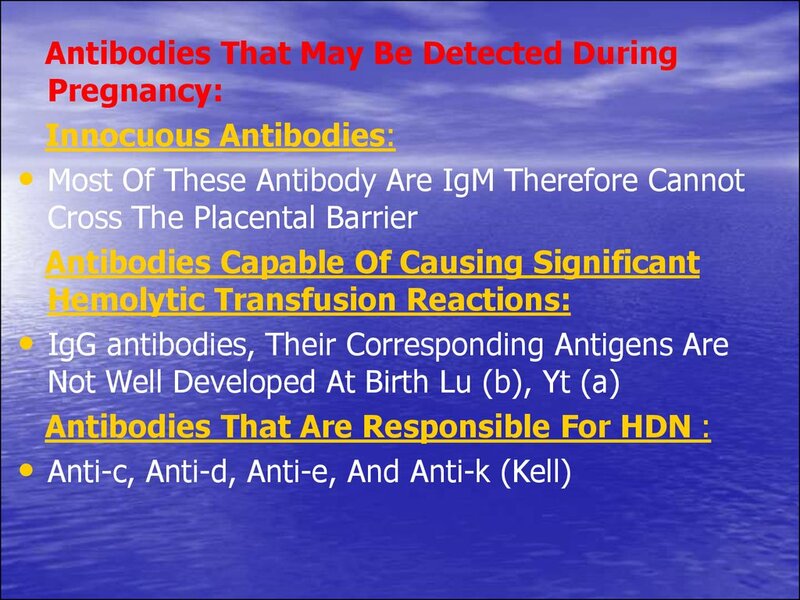 • Affected structures have a bright yellow color. 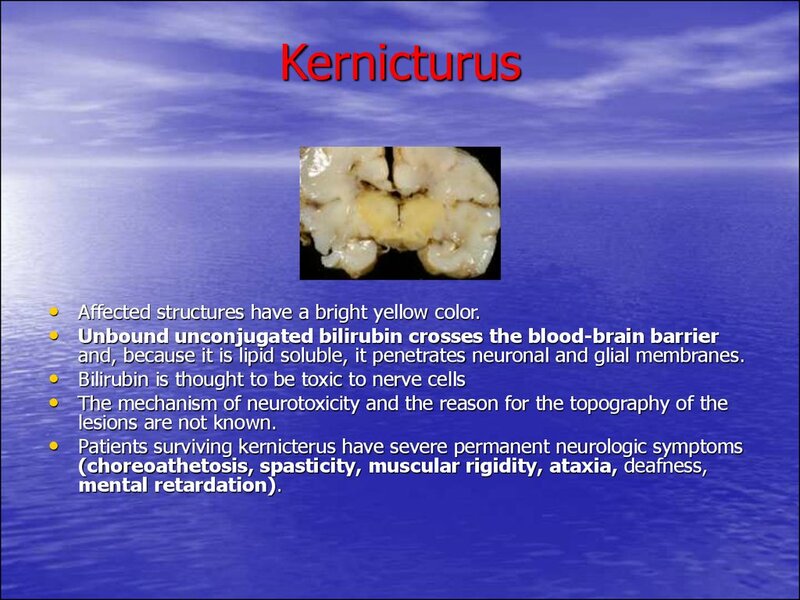 and, because it is lipid soluble, it penetrates neuronal and glial membranes. 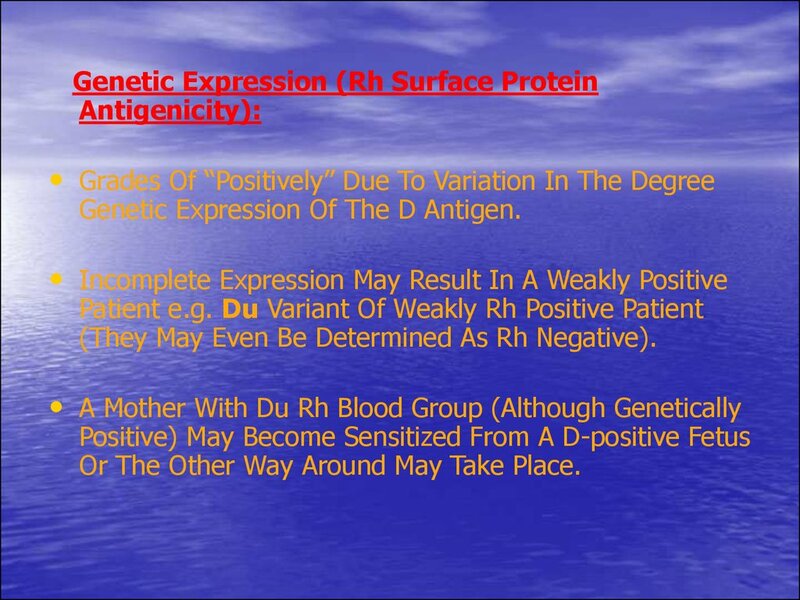 Homozygous And 60% Are Heterozygous). 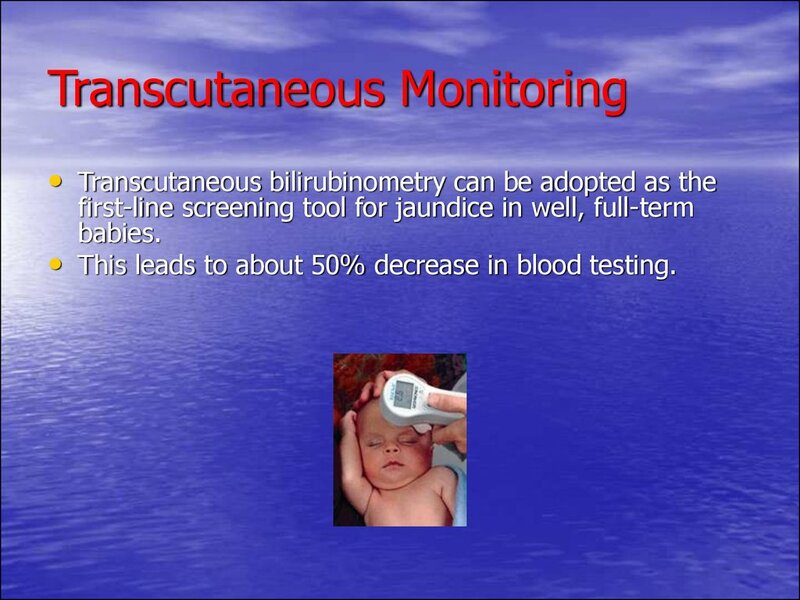 over 13 weeks - 300 mcg. 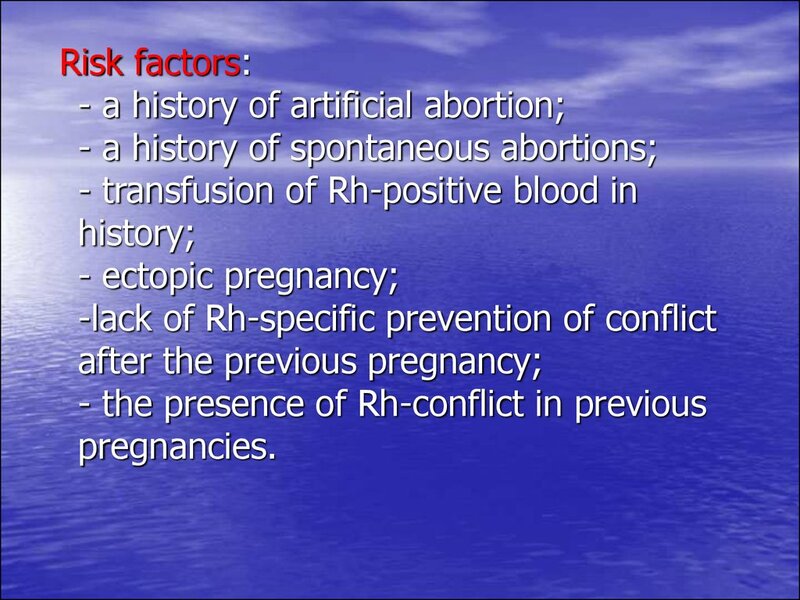 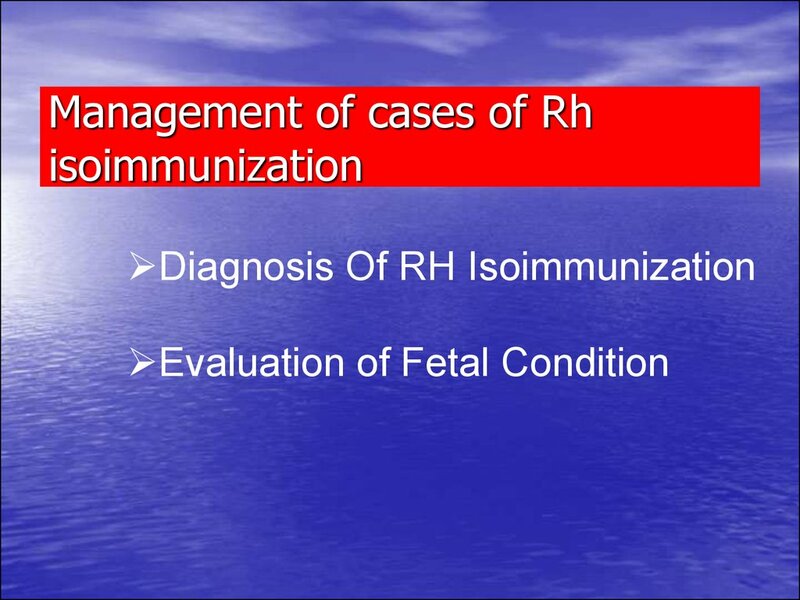 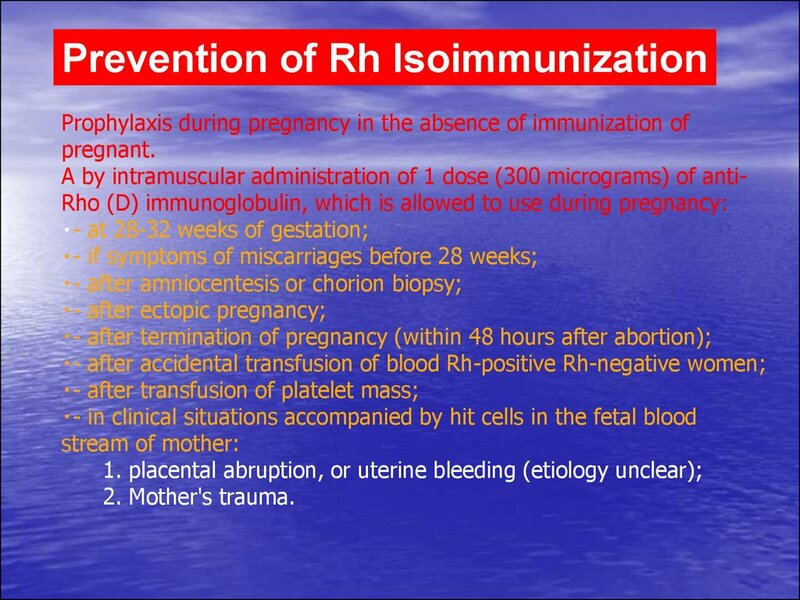 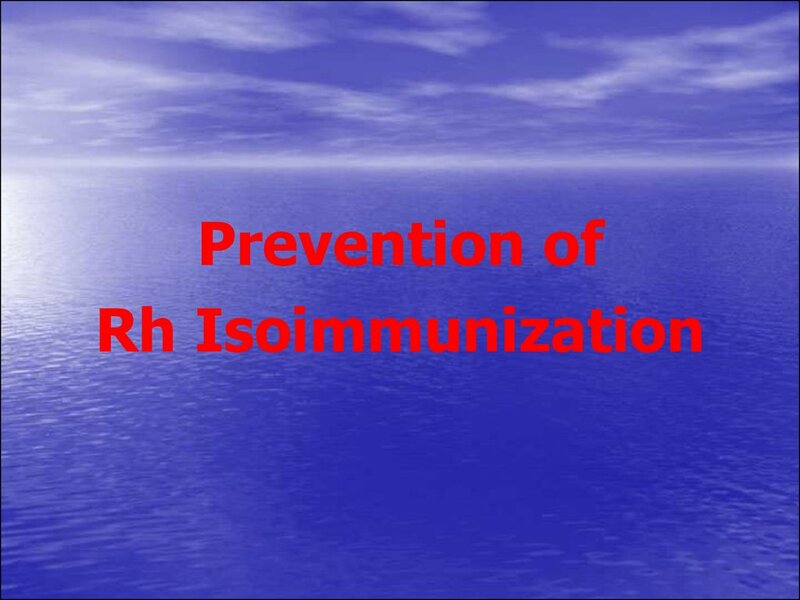 prevention izoimunizatsiyi in previous pregnancies. 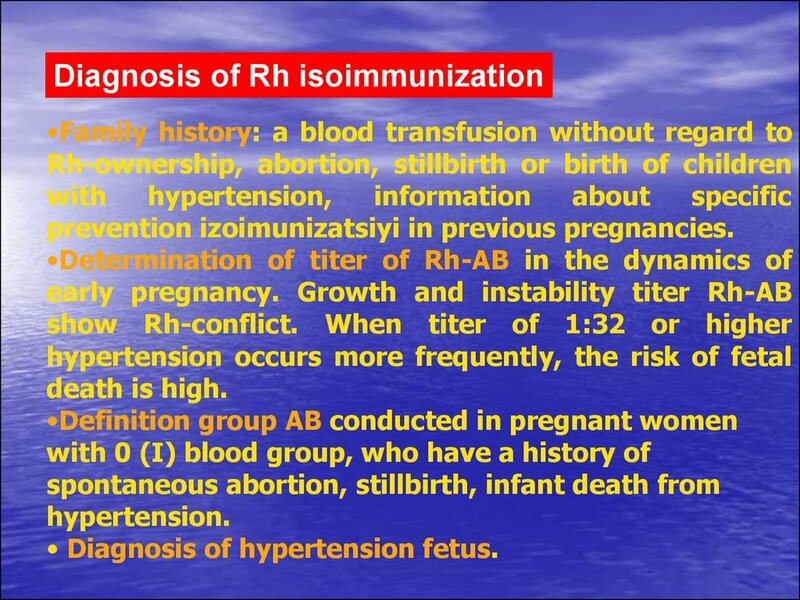 • Diagnosis of hypertension fetus. 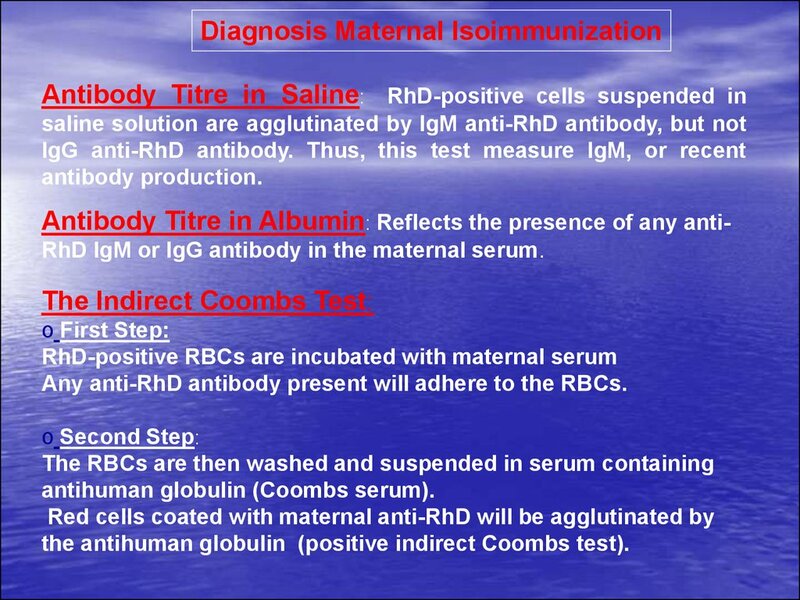 Antibody Titre in Albumin: Reflects the presence of any antiRhD IgM or IgG antibody in the maternal serum. 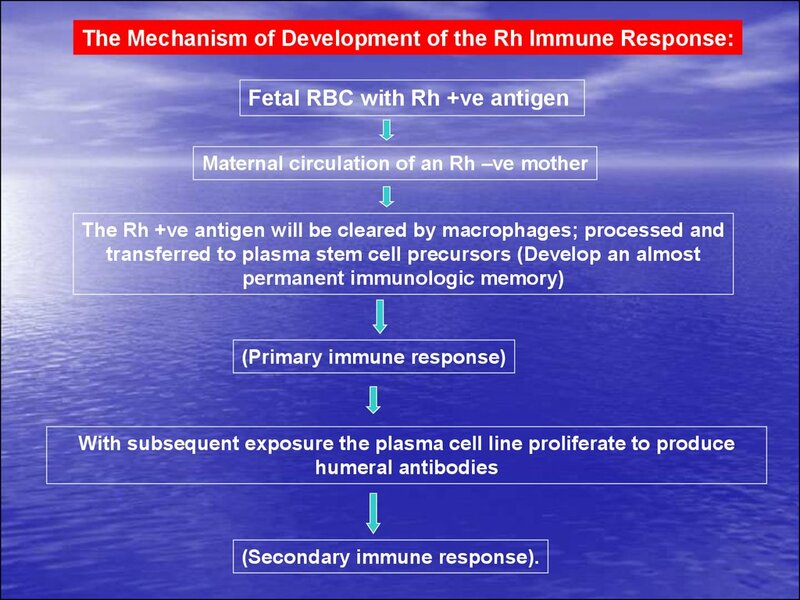 Any anti-RhD antibody present will adhere to the RBCs. 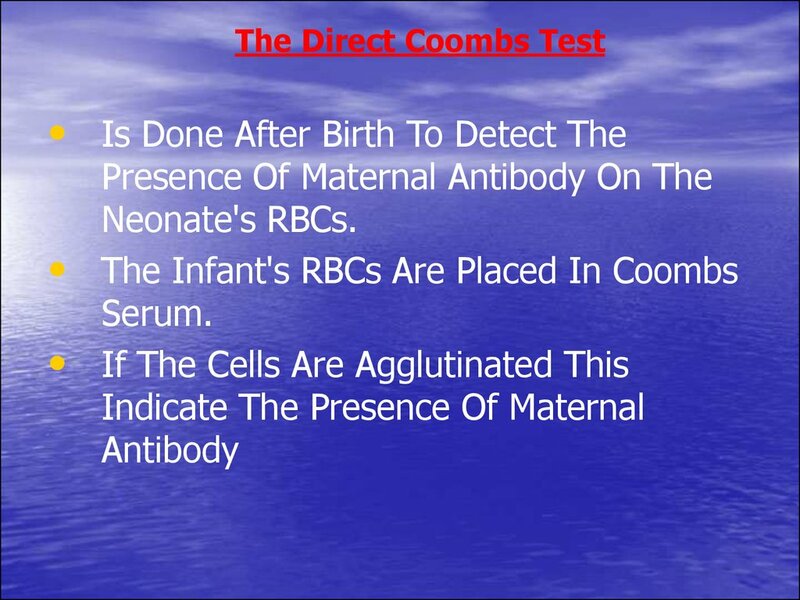 the antihuman globulin (positive indirect Coombs test). 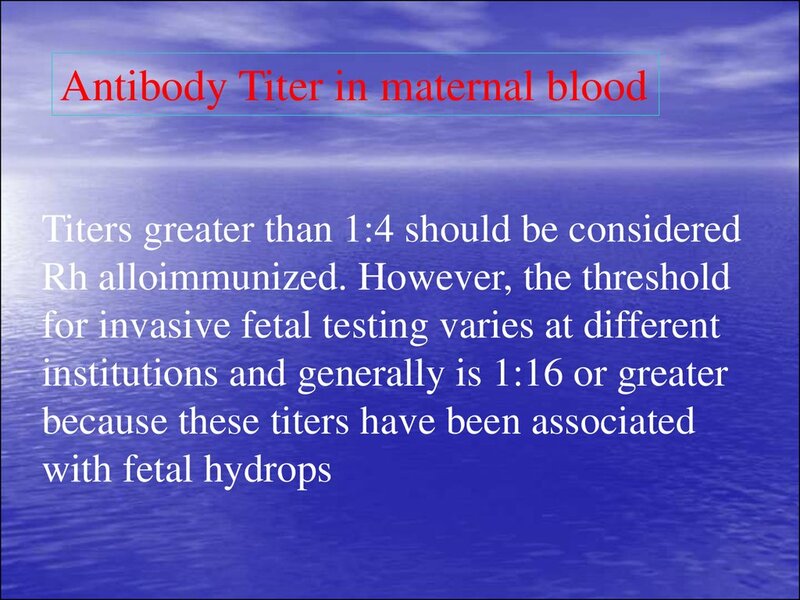 Antibody Titer Is A Screening Test. 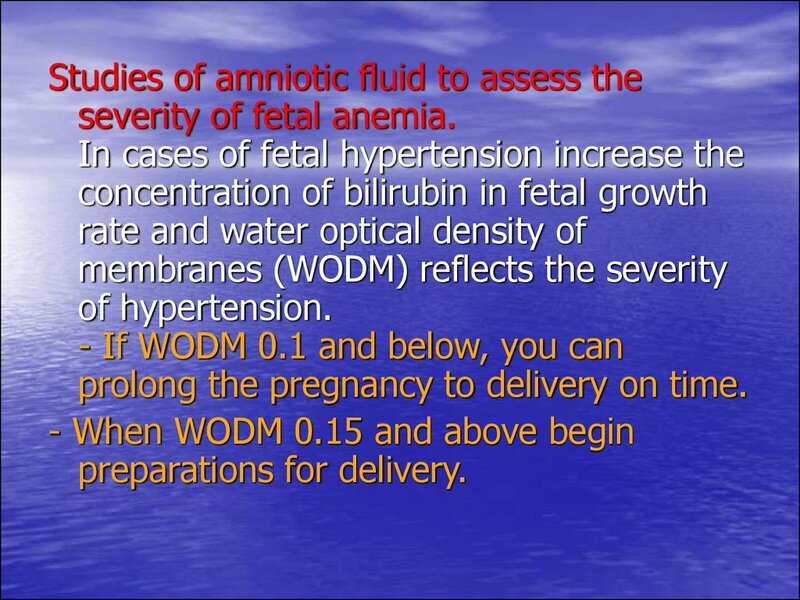 Dilution When Repeated In A Given Laboratory. 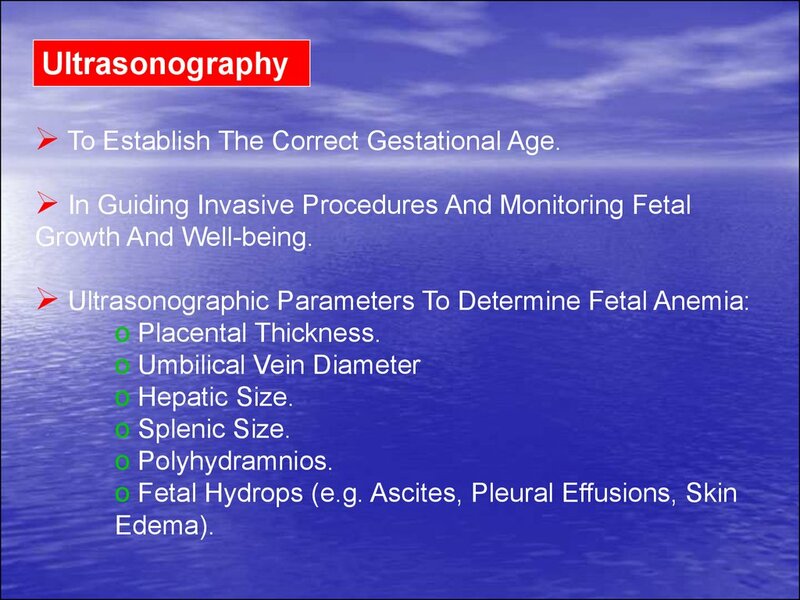 To Establish The Correct Gestational Age. 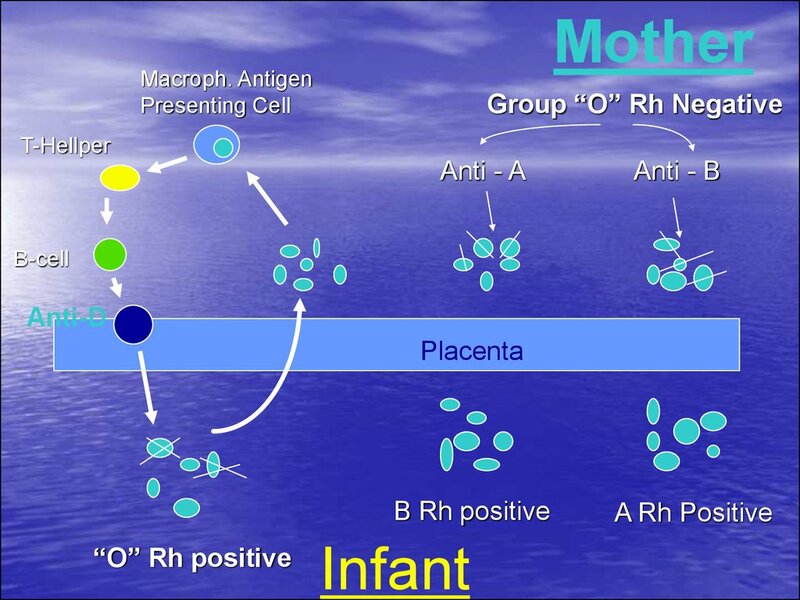 - thickening of the placenta. 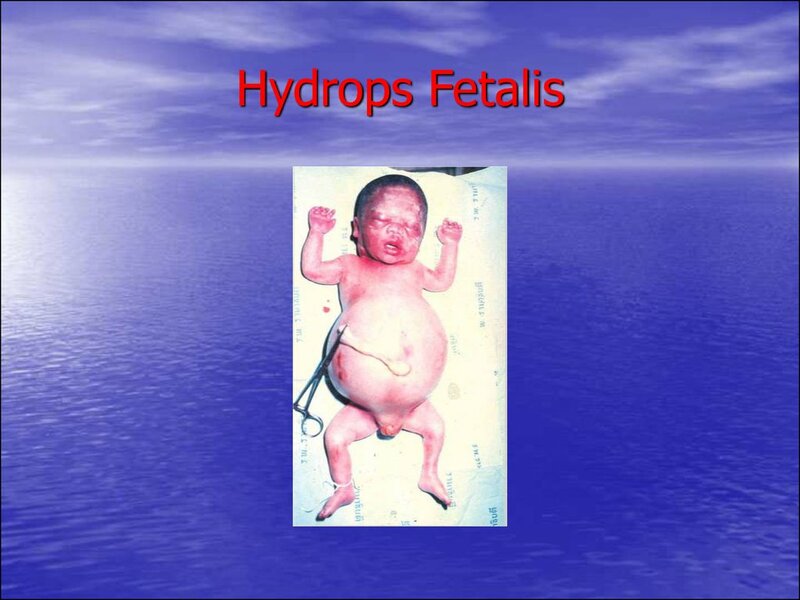 - when there are signs of fetal every day to delivery. 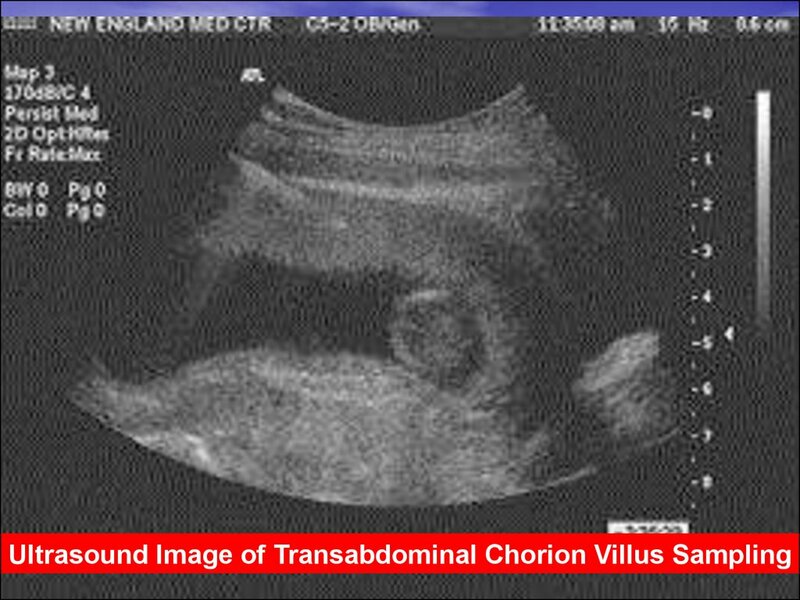 after 26 weeks of pregnancy. 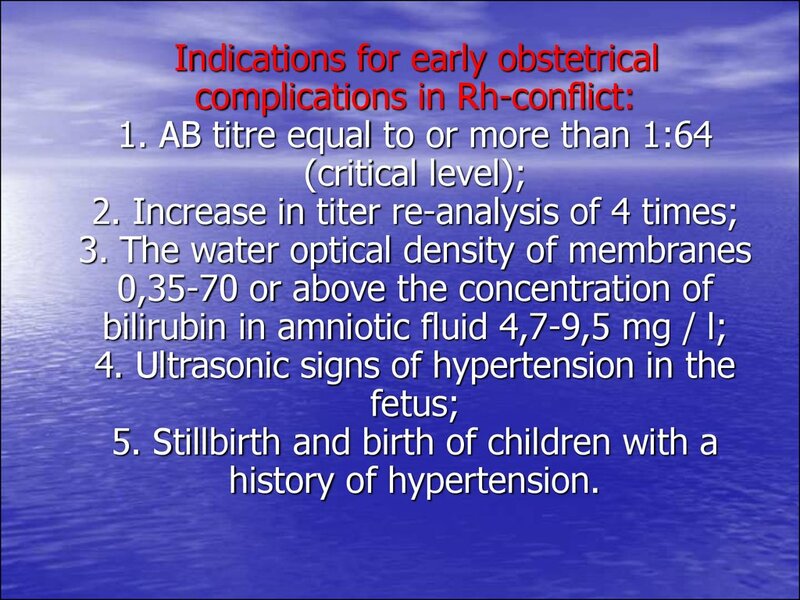 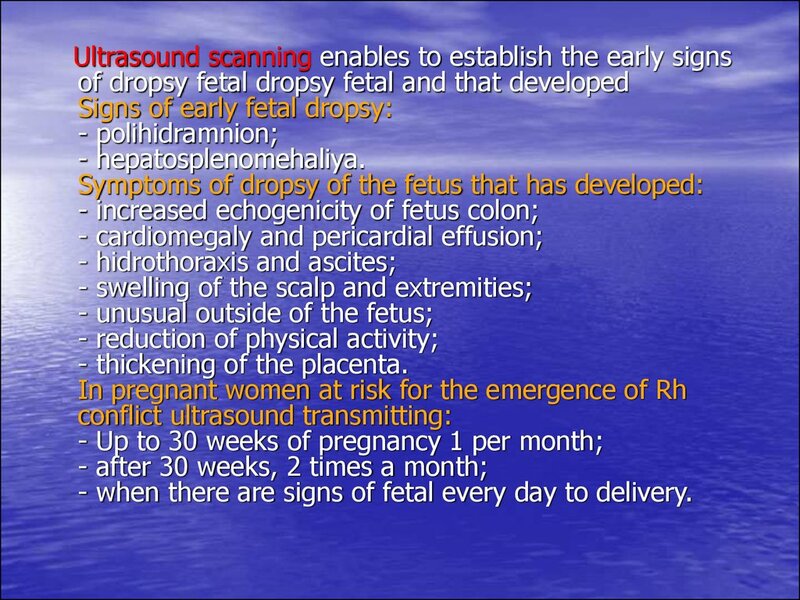 and ultrasound signs of fetal hypertension. 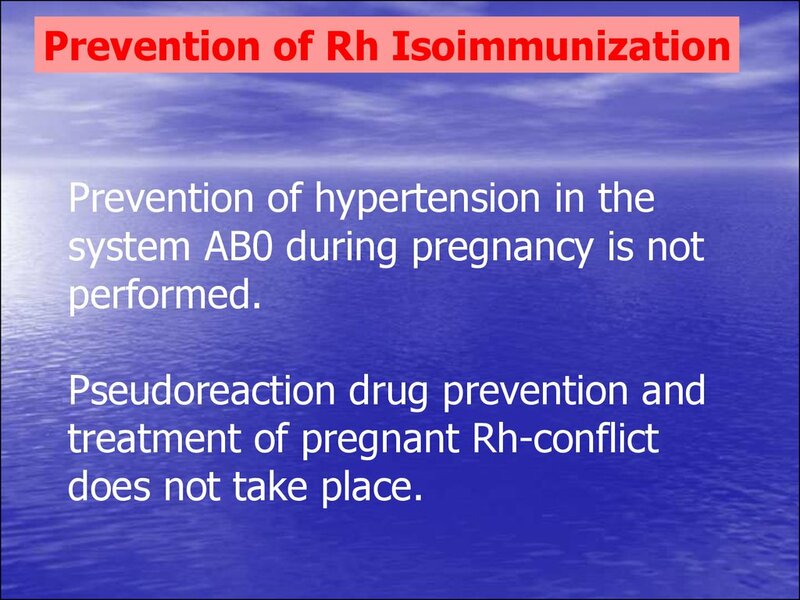 prolong the pregnancy to delivery on time. 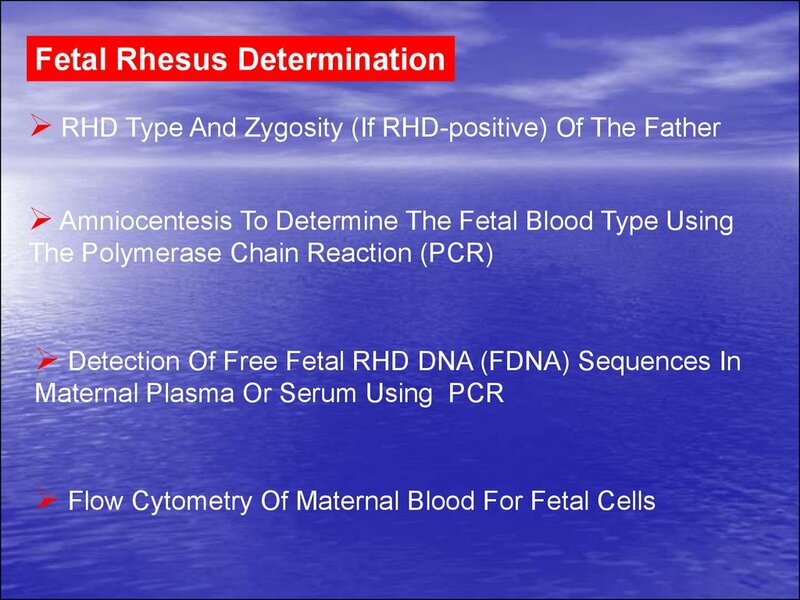 - AT, fixed on erythrocytes of the fetus. 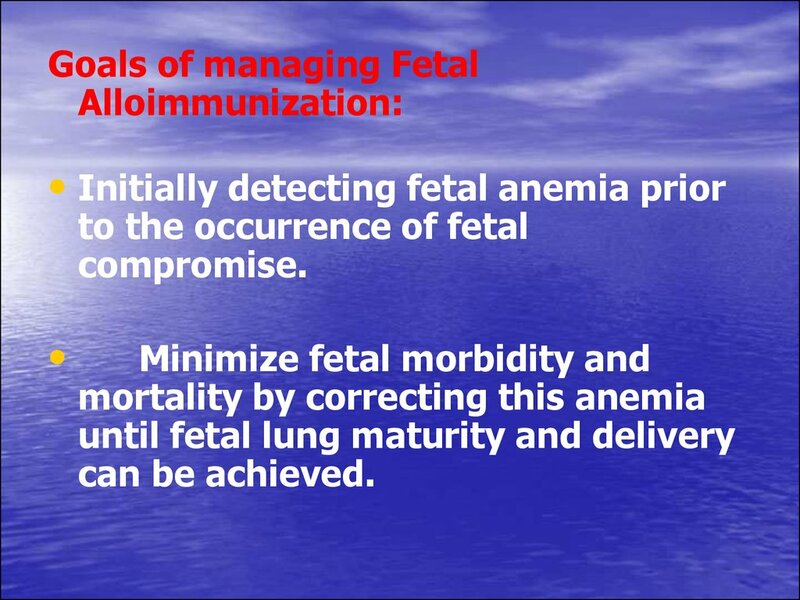 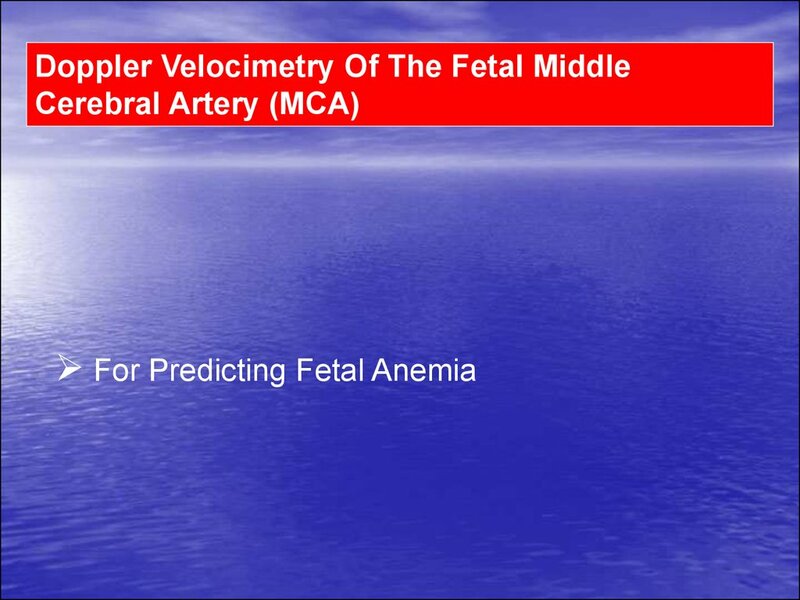 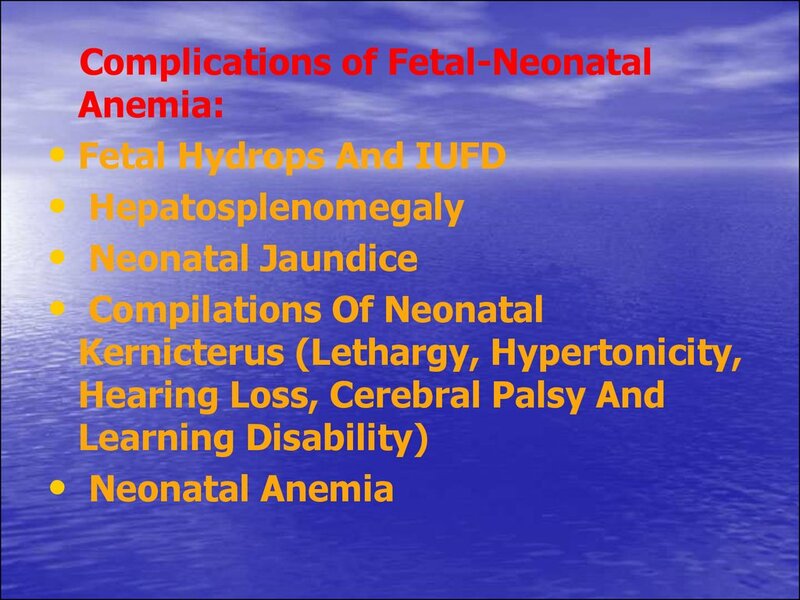 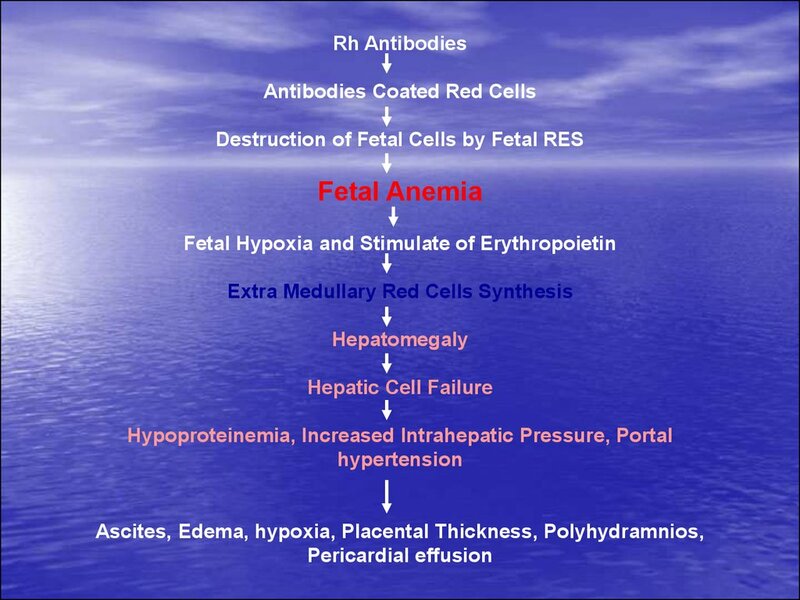 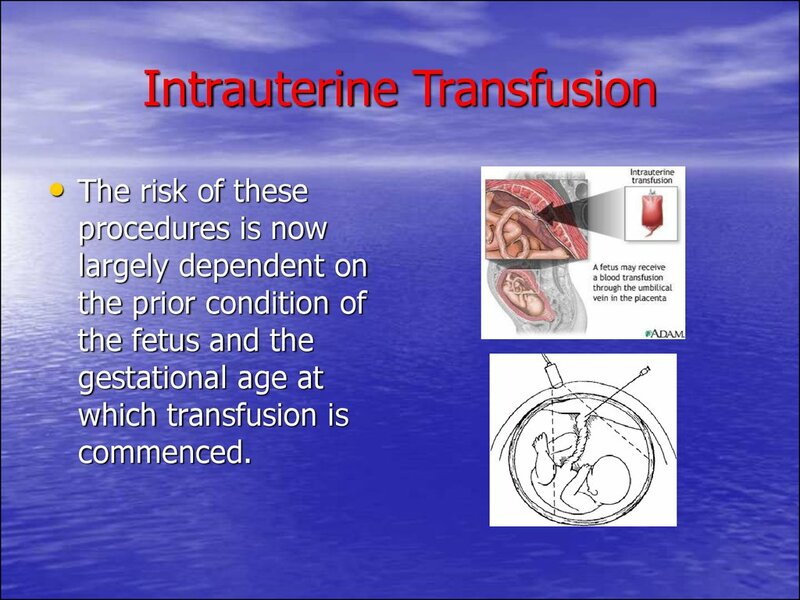 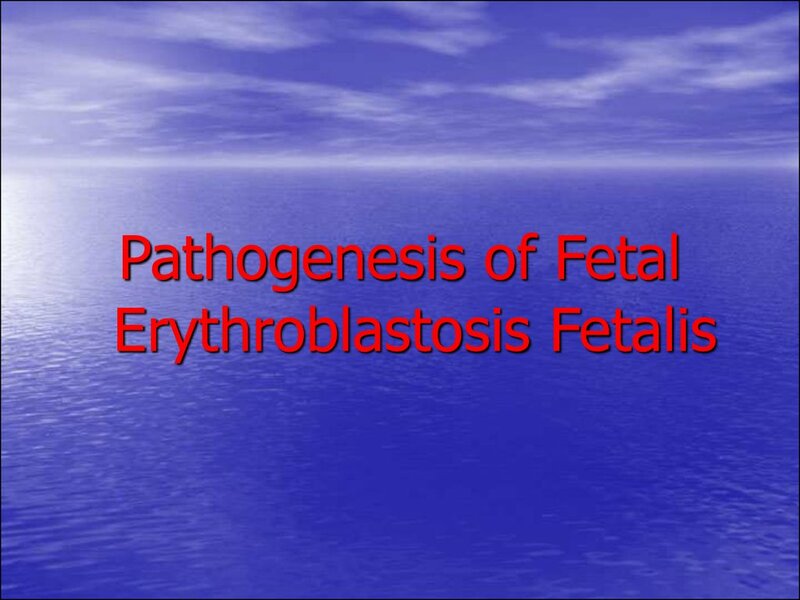 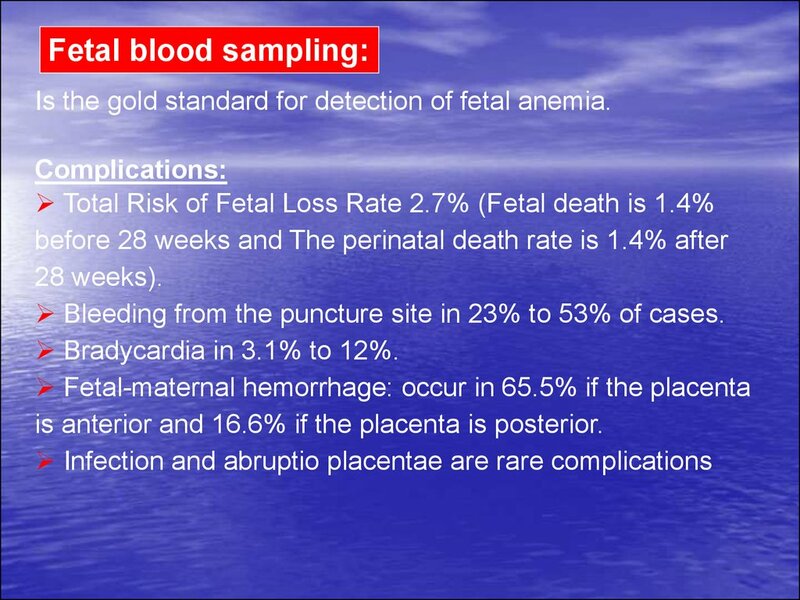 Is the gold standard for detection of fetal anemia. 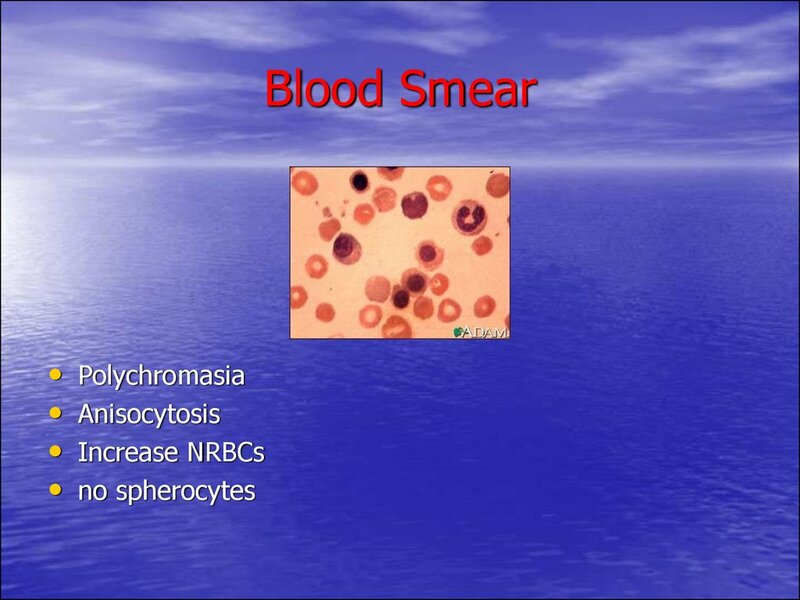 Bleeding from the puncture site in 23% to 53% of cases. 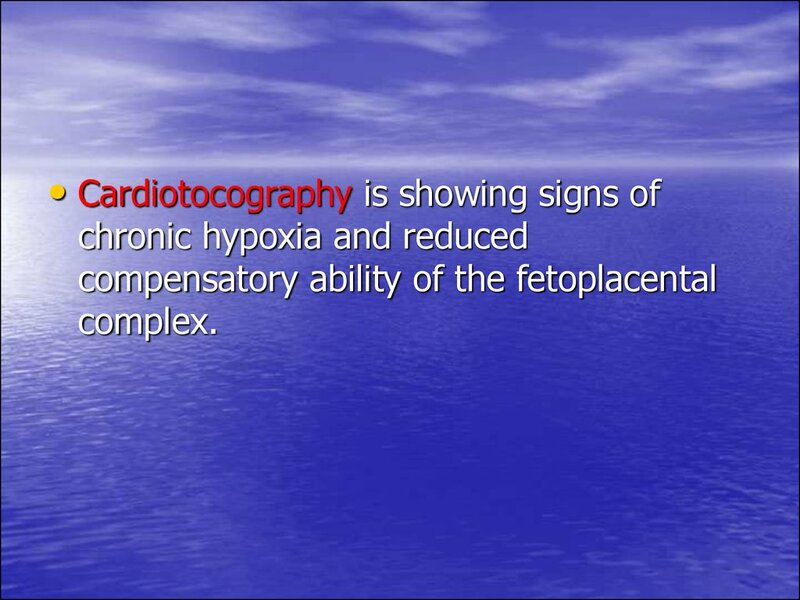 Bradycardia in 3.1% to 12%. 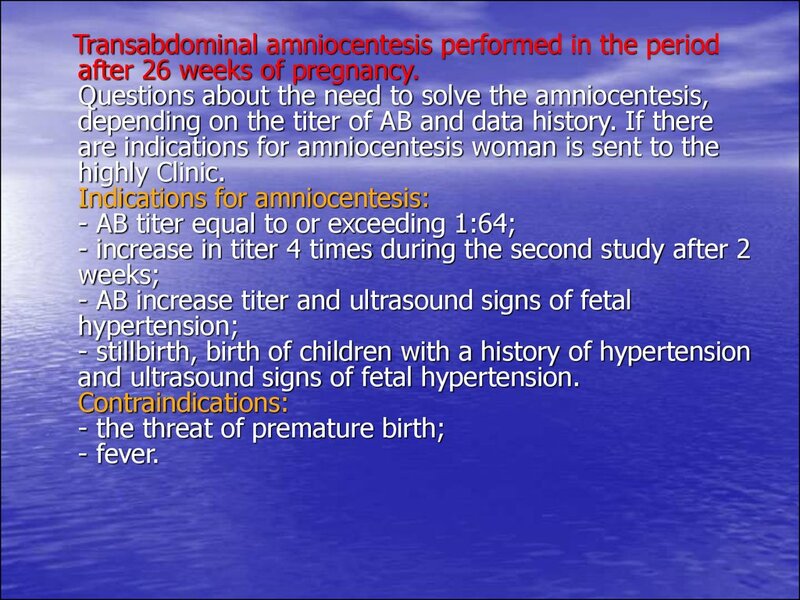 is anterior and 16.6% if the placenta is posterior. 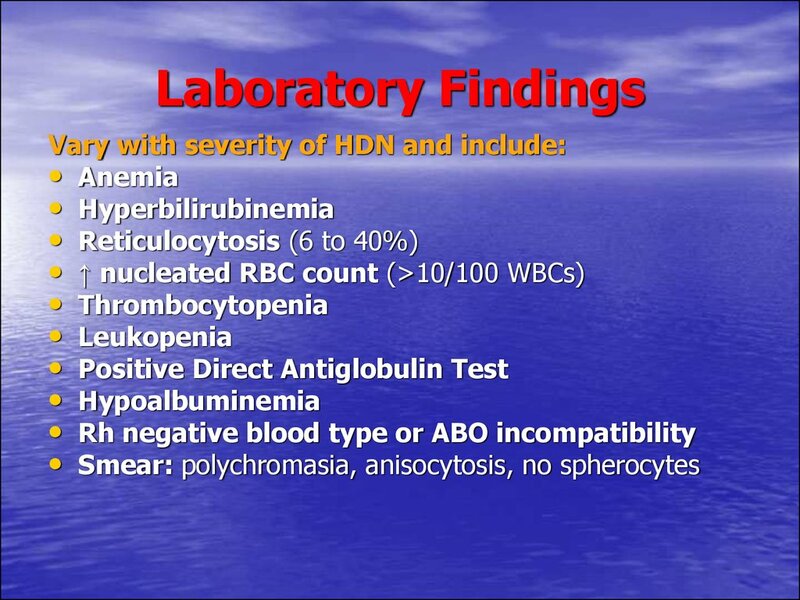 This leads to about 50% decrease in blood testing. 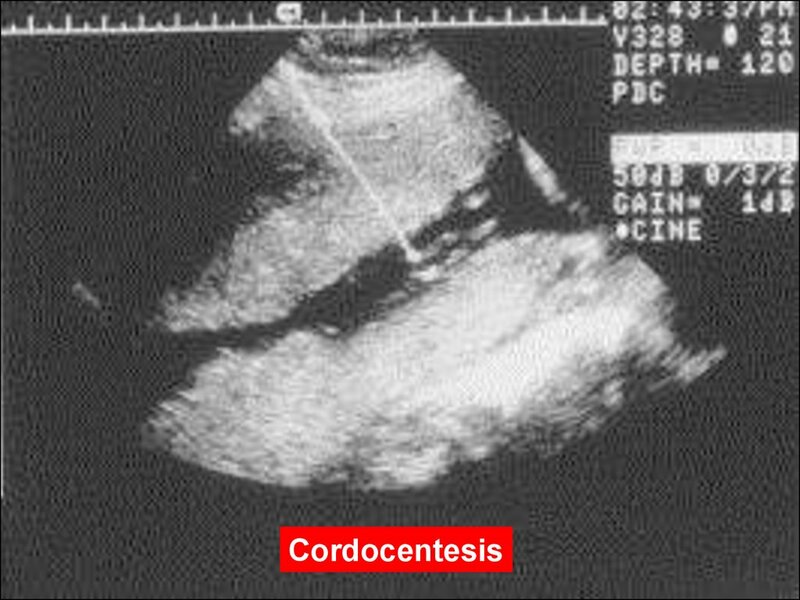 maturity of the fetus's lungs before delivery is scheduled. 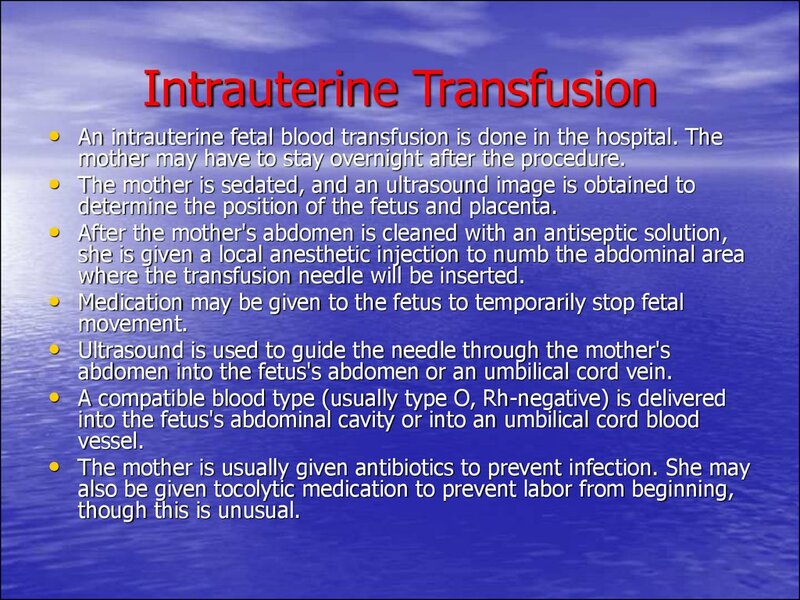 mother may have to stay overnight after the procedure. 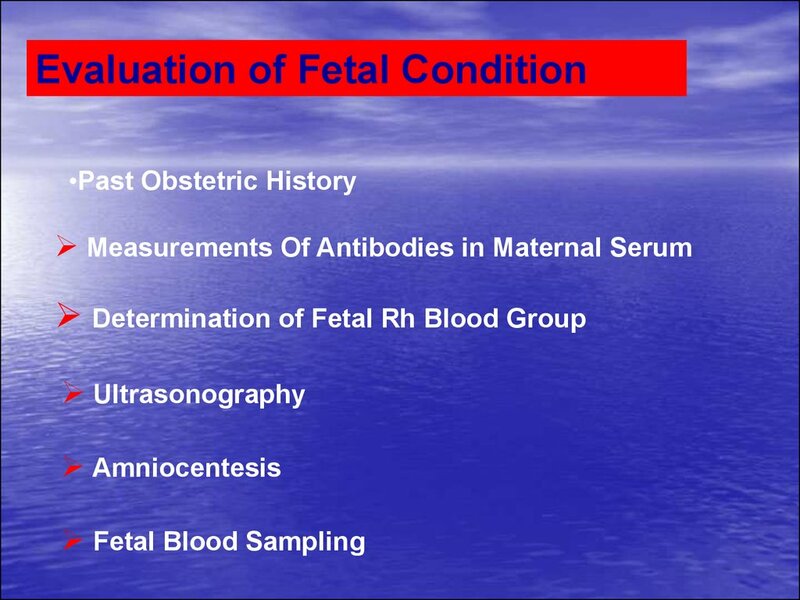 determine the position of the fetus and placenta. 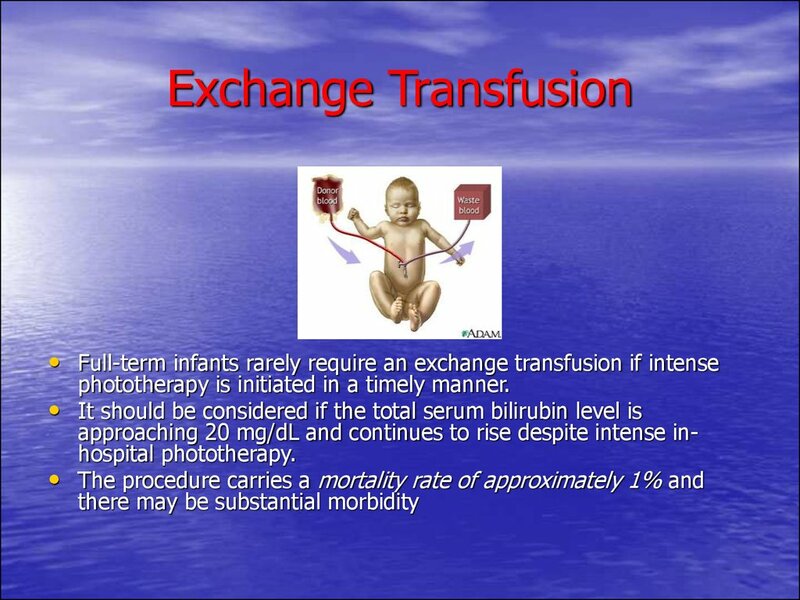 where the transfusion needle will be inserted. 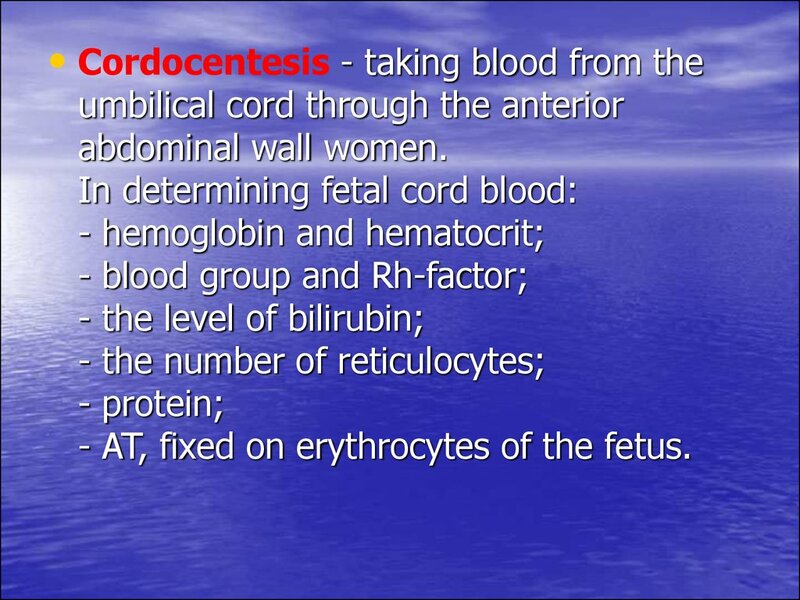 abdomen into the fetus's abdomen or an umbilical cord vein. 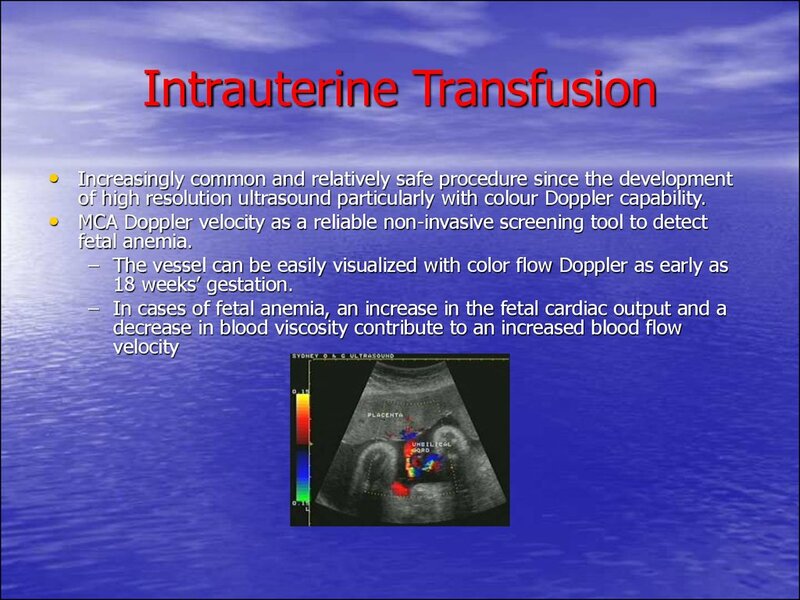 of high resolution ultrasound particularly with colour Doppler capability. 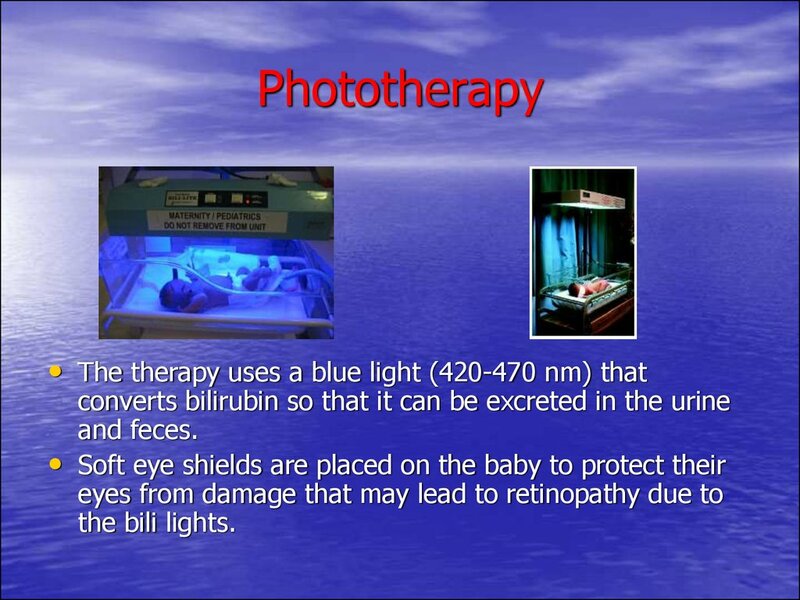 • Phototherapy is the treatment of choice. 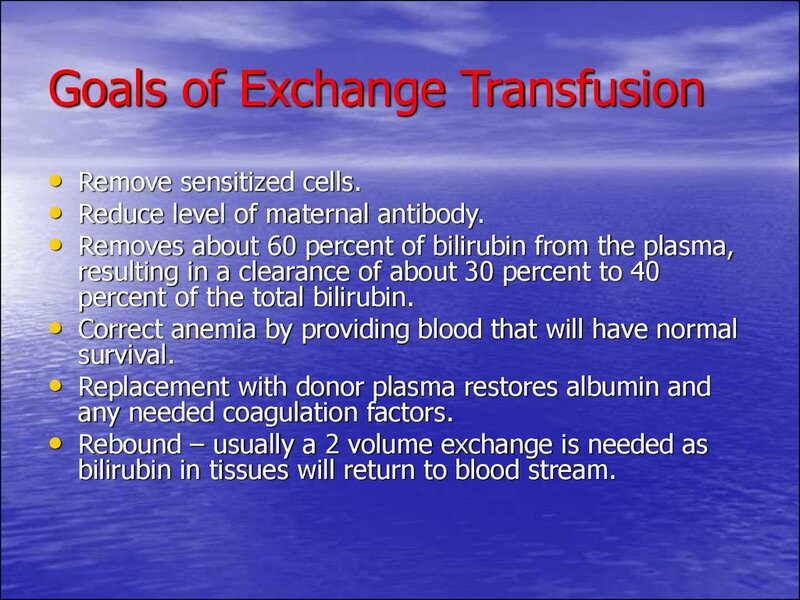 transported in the plasma to the liver. 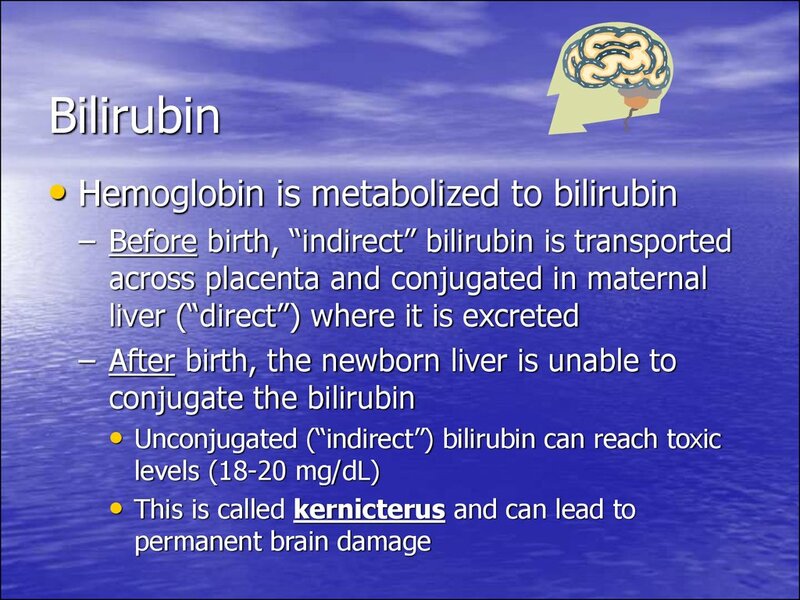 bilirubin level reaches 12 mg/dL or more. 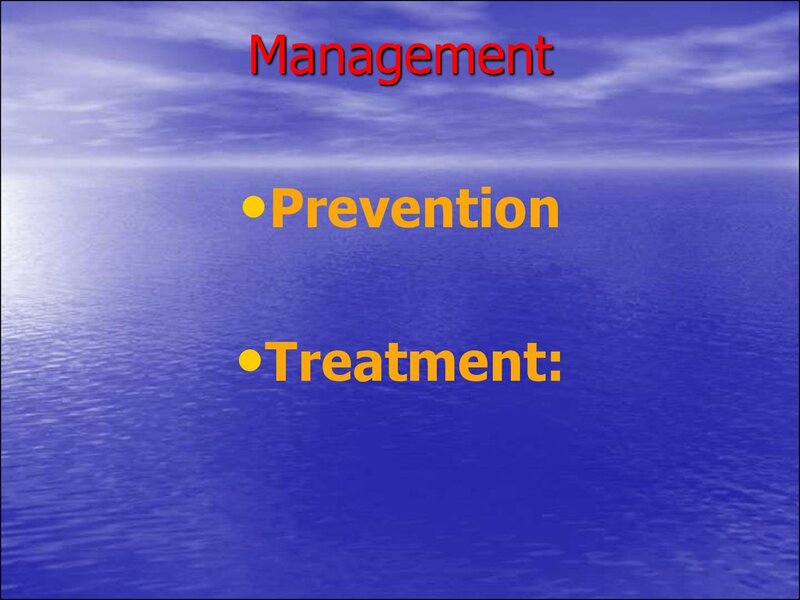 phototherapy is initiated in a timely manner. 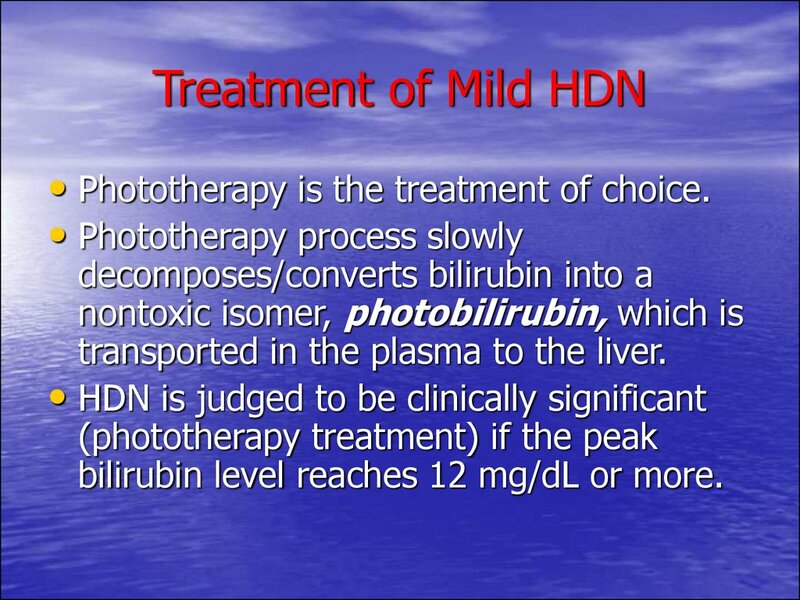 approaching 20 mg/dL and continues to rise despite intense inhospital phototherapy. 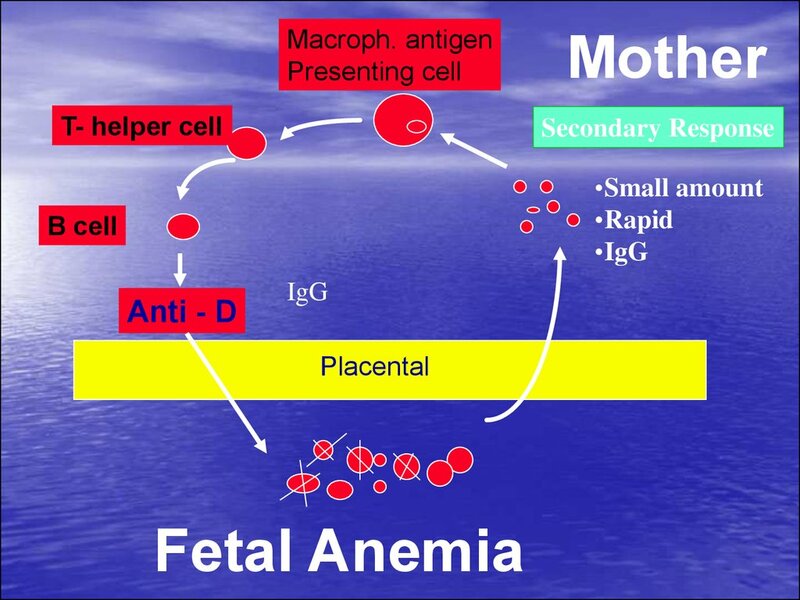 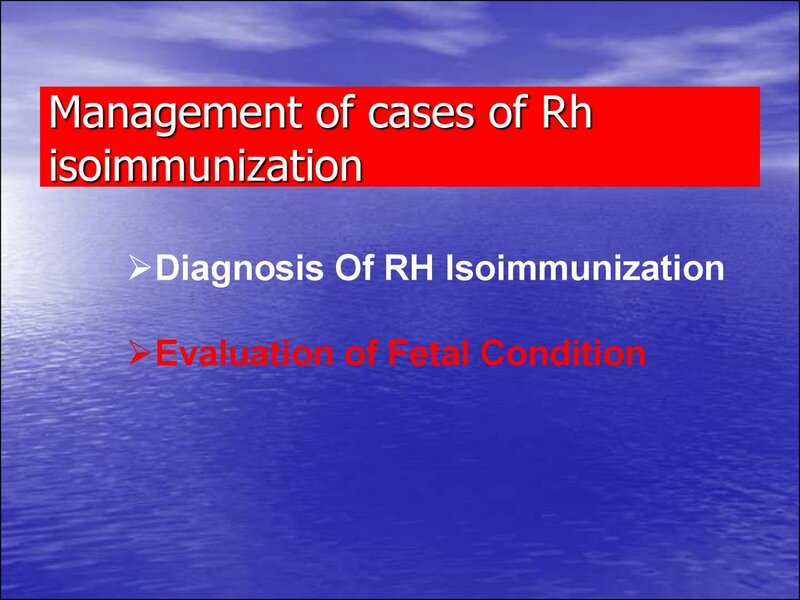 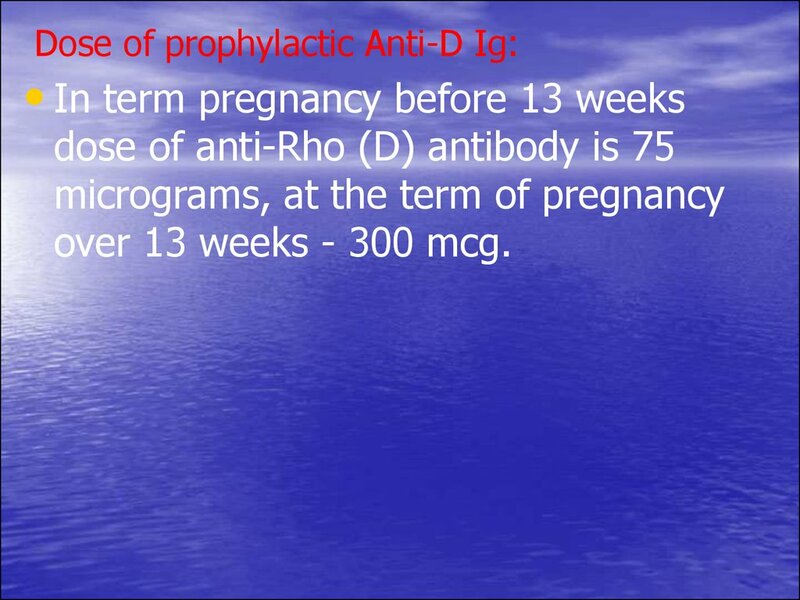 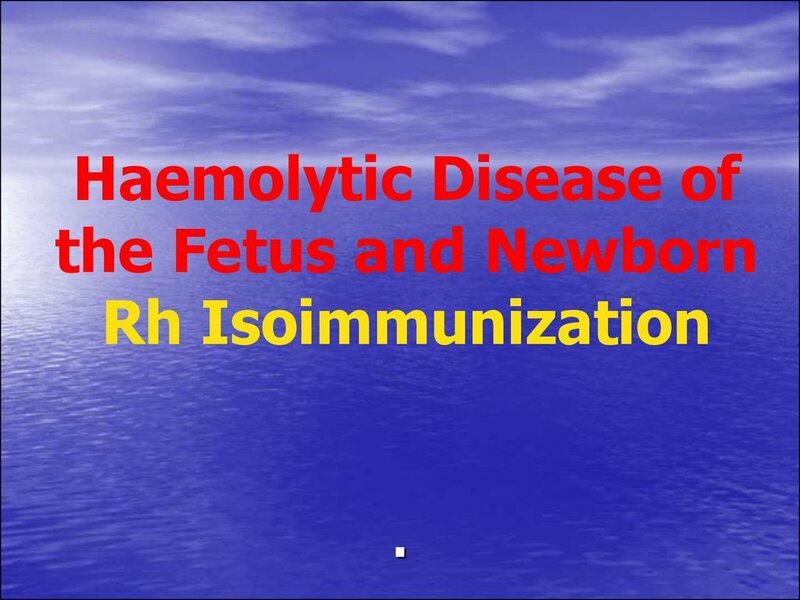 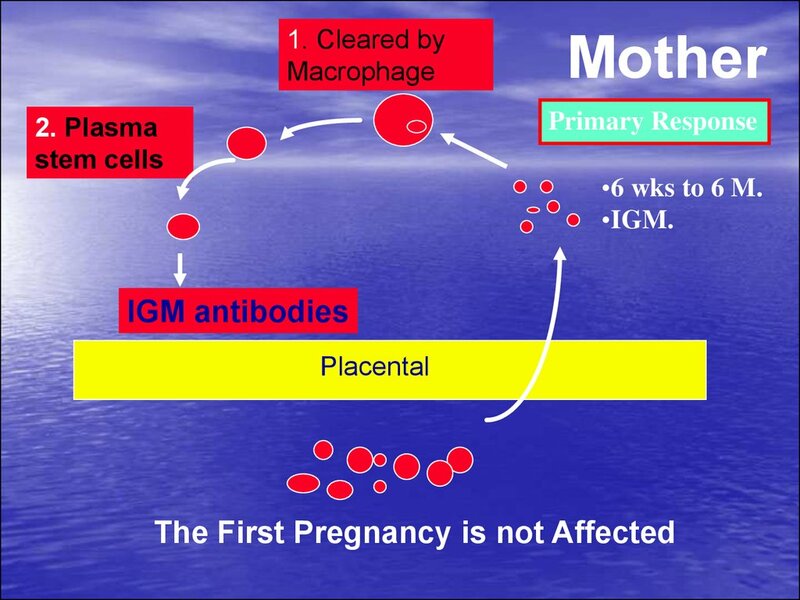 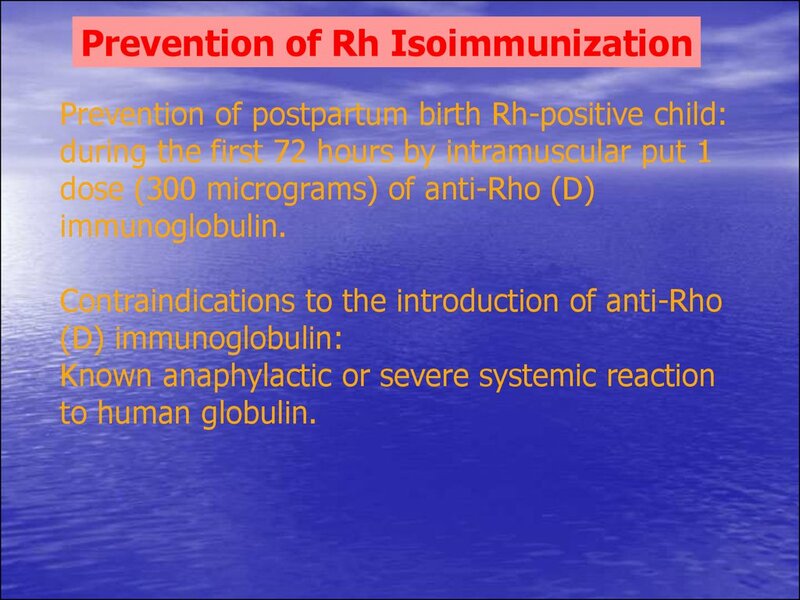 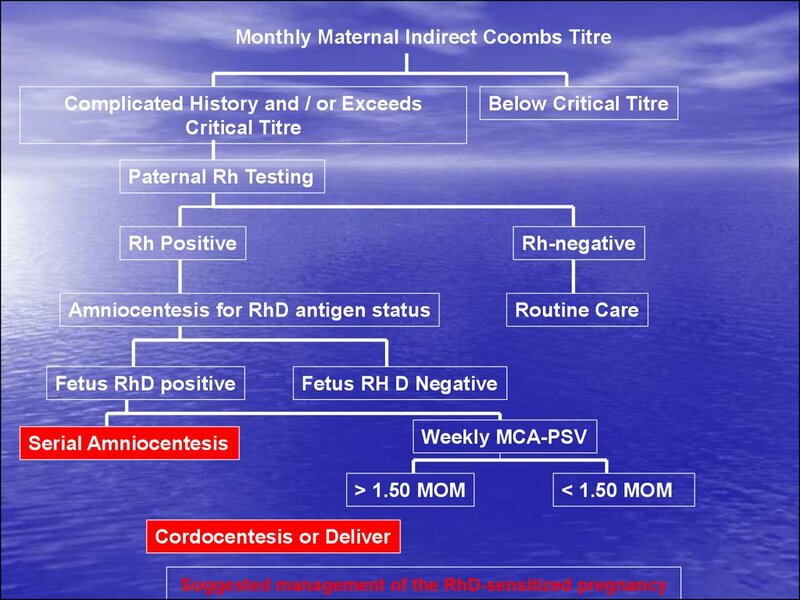 • Reduce level of maternal antibody. 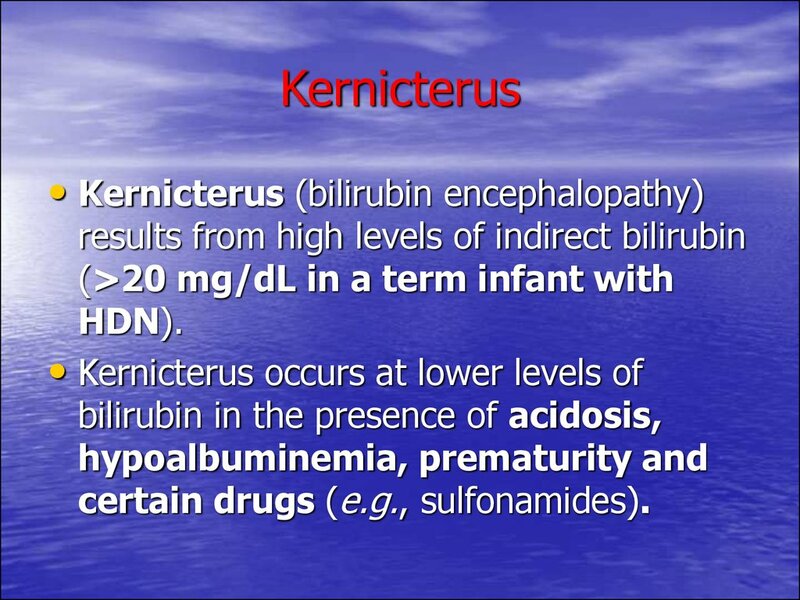 percent of the total bilirubin. 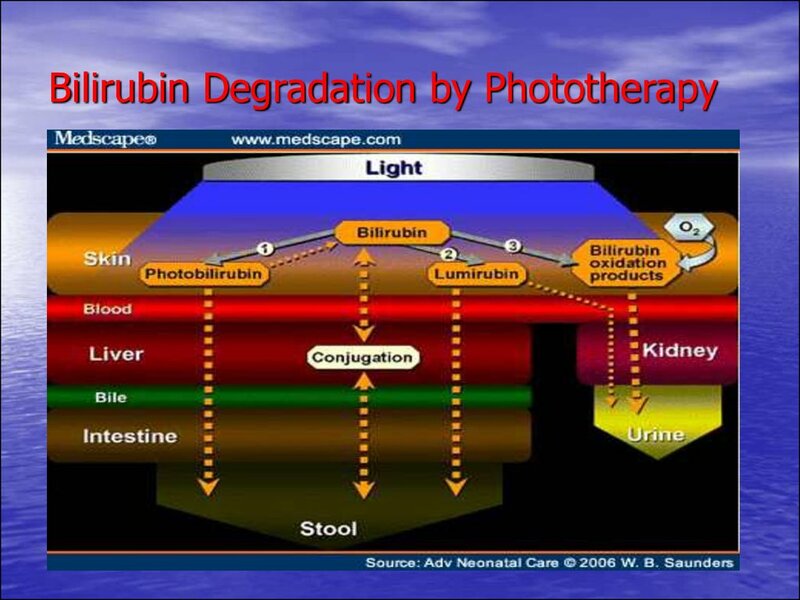 bilirubin in tissues will return to blood stream. 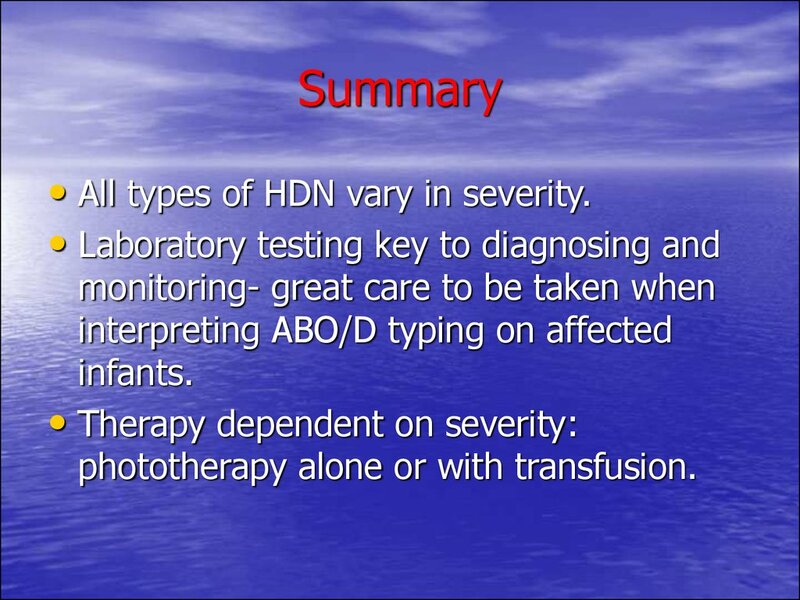 • All types of HDN vary in severity. 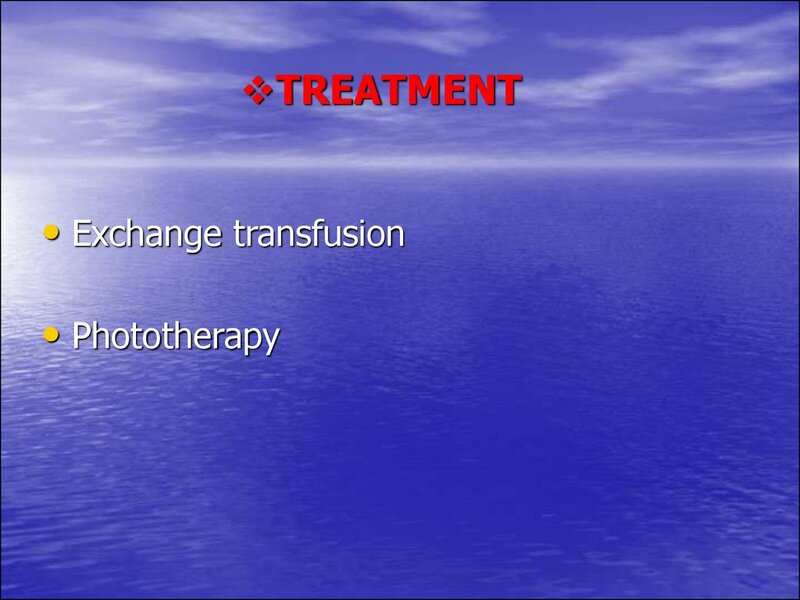 phototherapy alone or with transfusion.